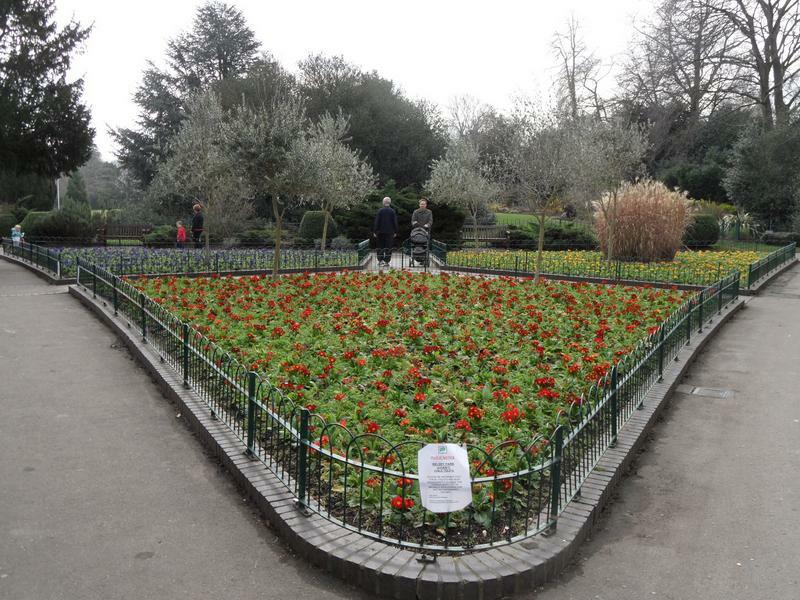 Formal planting at the Manor Way west side entrance to Kelsey Park, no dogs allowed in this part of the park. 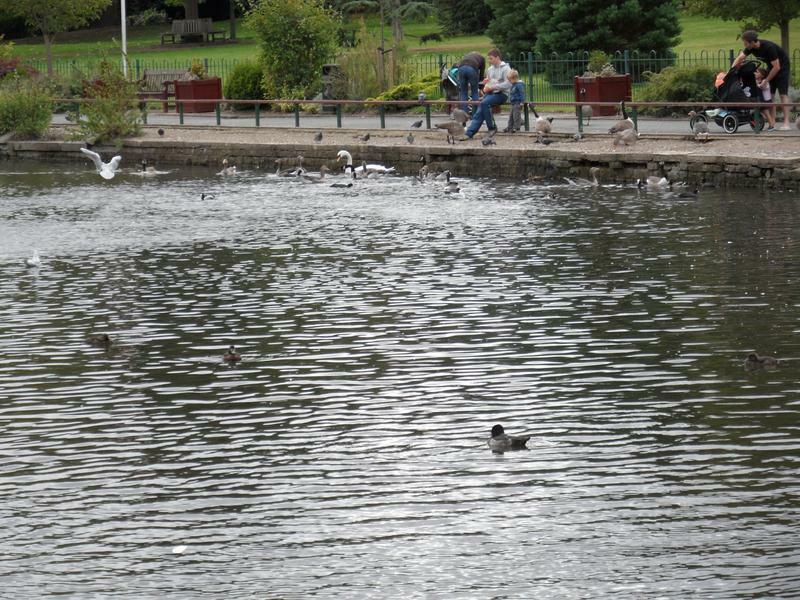 Near the cafe on the east side of the park, far too many noisy sea birds. 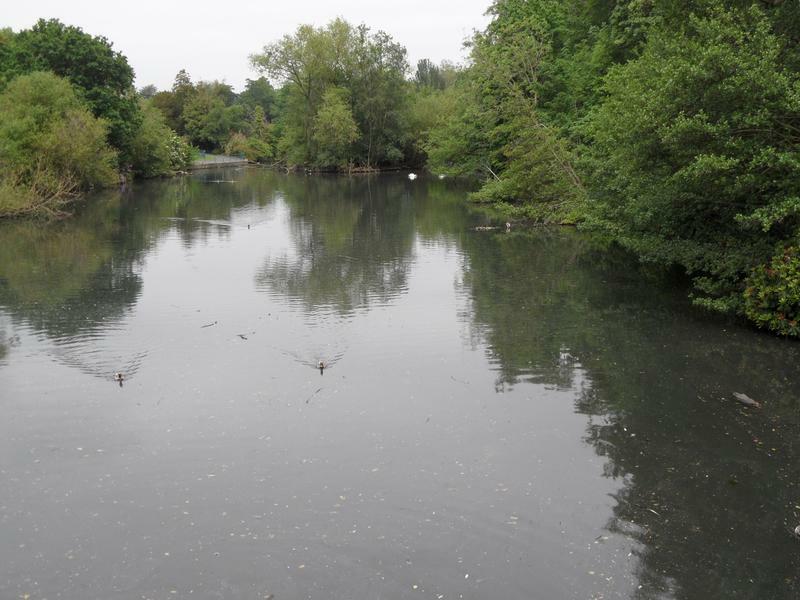 The first lake at the southern part of Kelsey Park, few birds here at the moment. 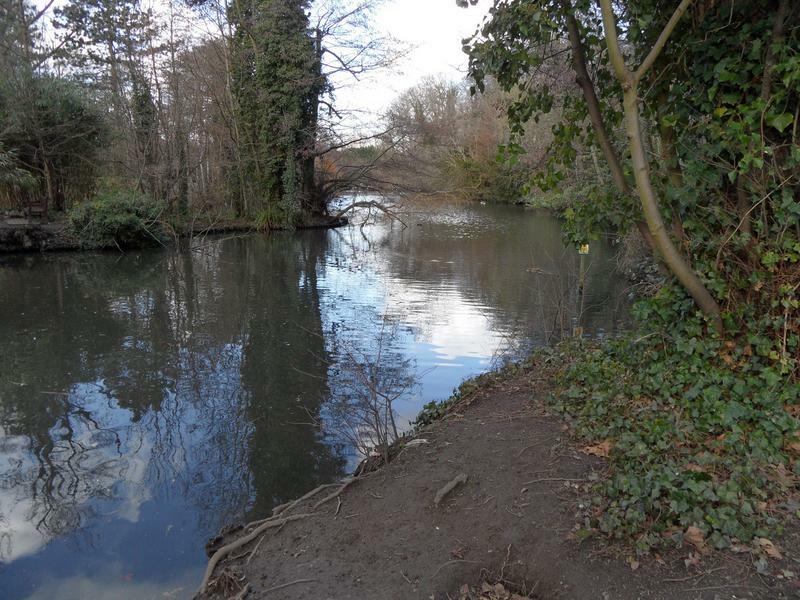 The second lake with an island in the distance, relatively quiet as well. 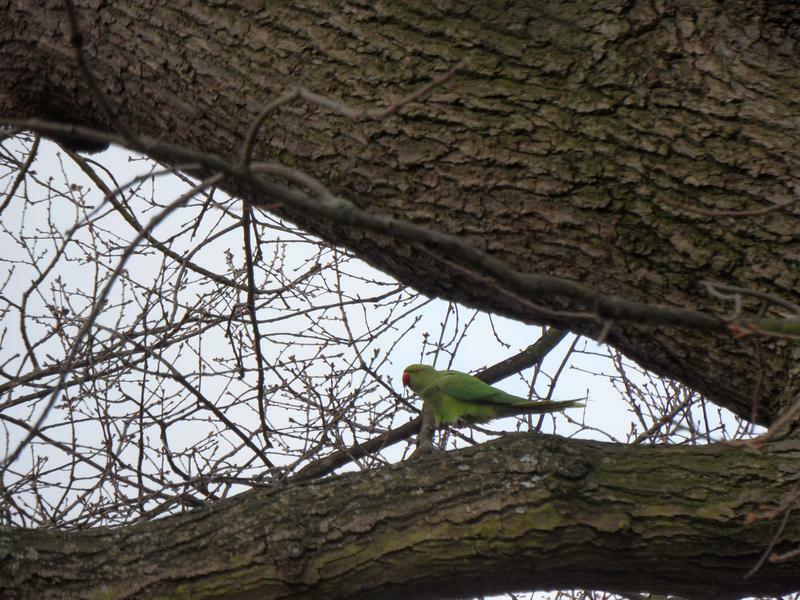 22nd January 2012, a Ring-necked Parakeet (or parrot) in one of the park trees. 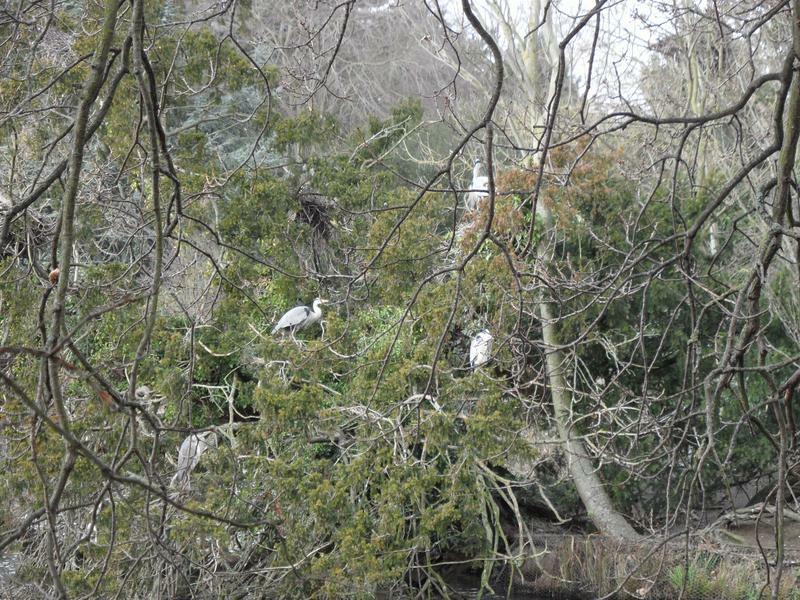 Several Grey Herons perching on different tree branches on one of the islands. 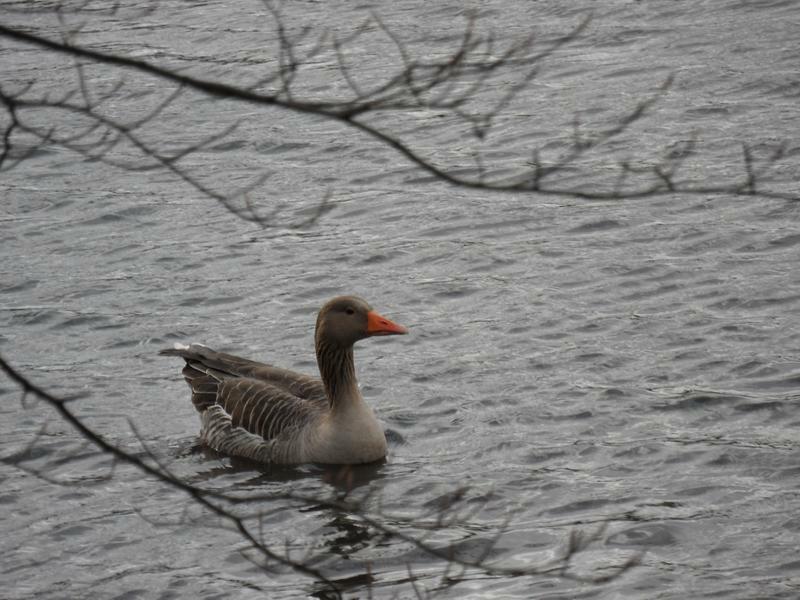 Greylag Goose, possibly a winter visitor from Iceland, did not see any last summer. 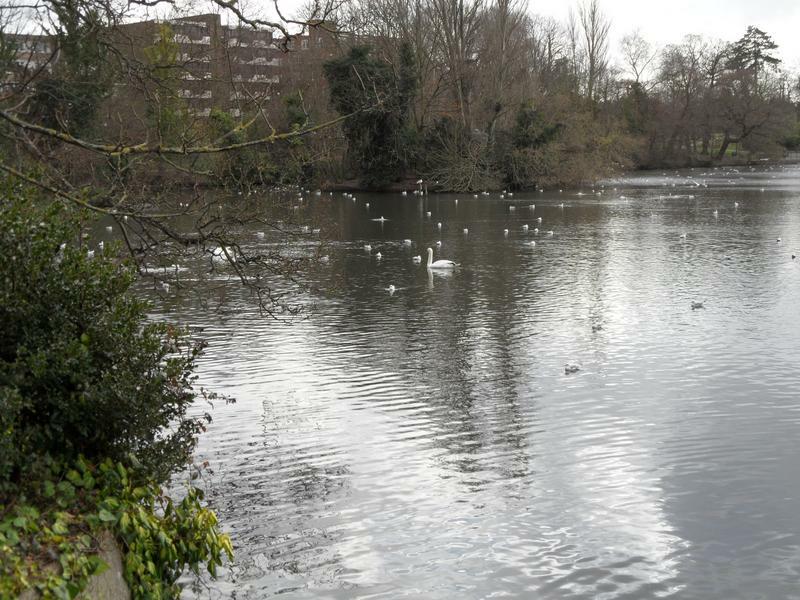 The large central lake, with a pair of swans. 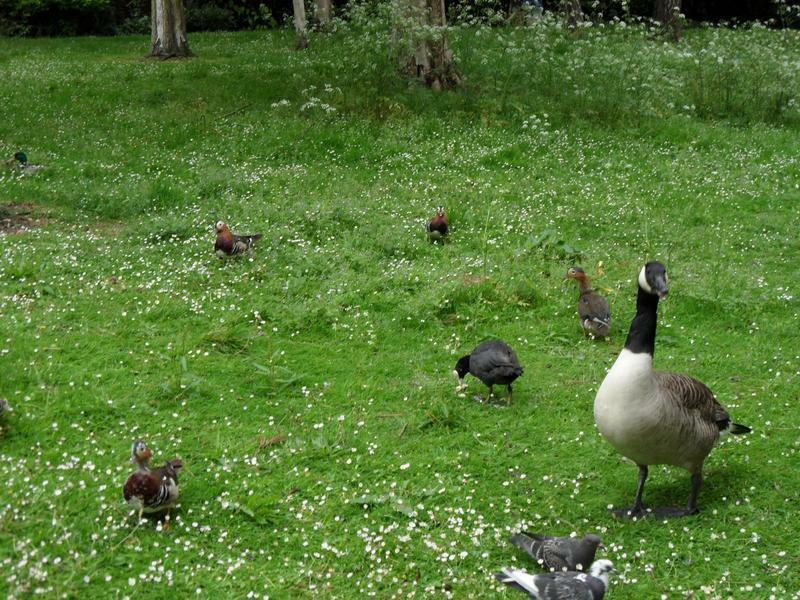 so they are less conspicuous when nesting. 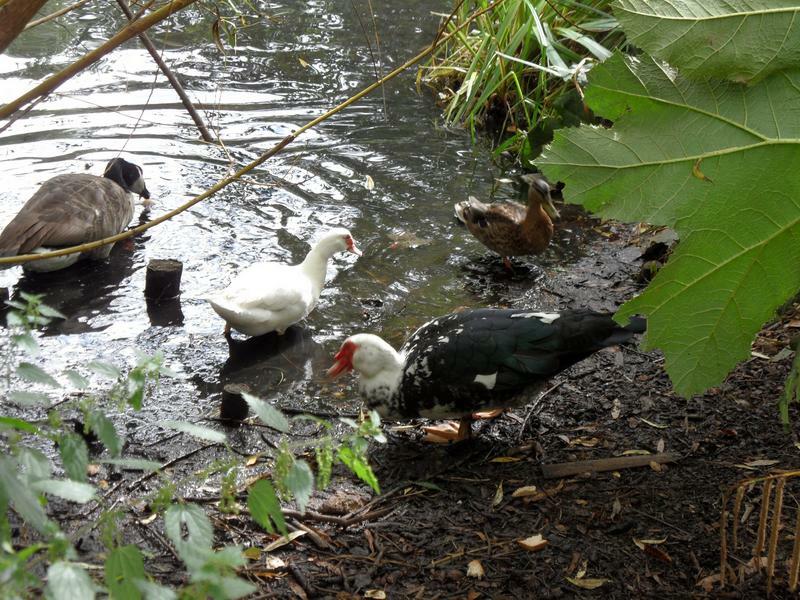 Ivan, the Muscovy Duck in the centre of the lake, with a pair of Canada Geese in the background. 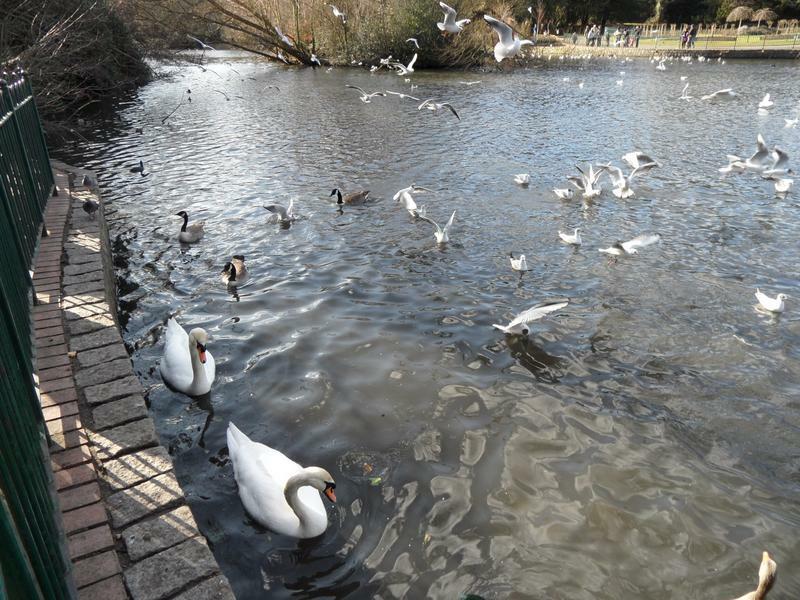 19th February 2012, the swans also looking for food. 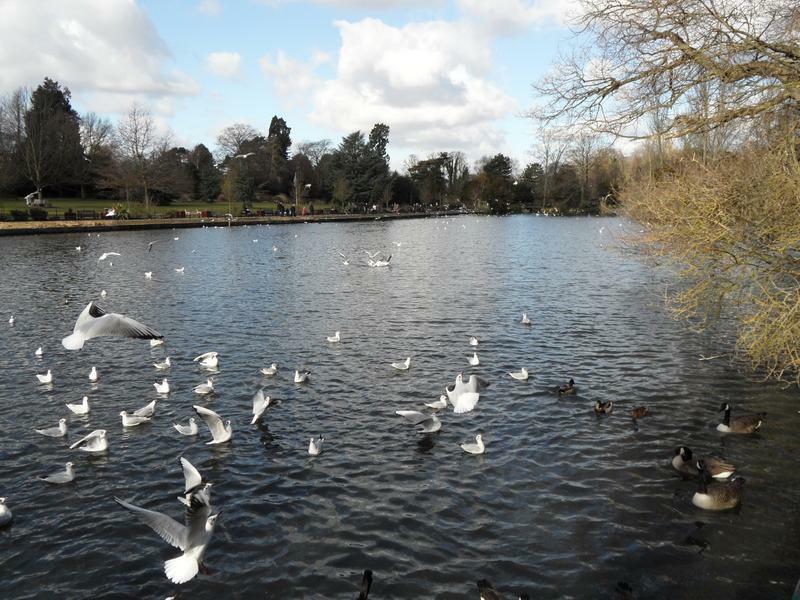 Too many sea birds on the lake. 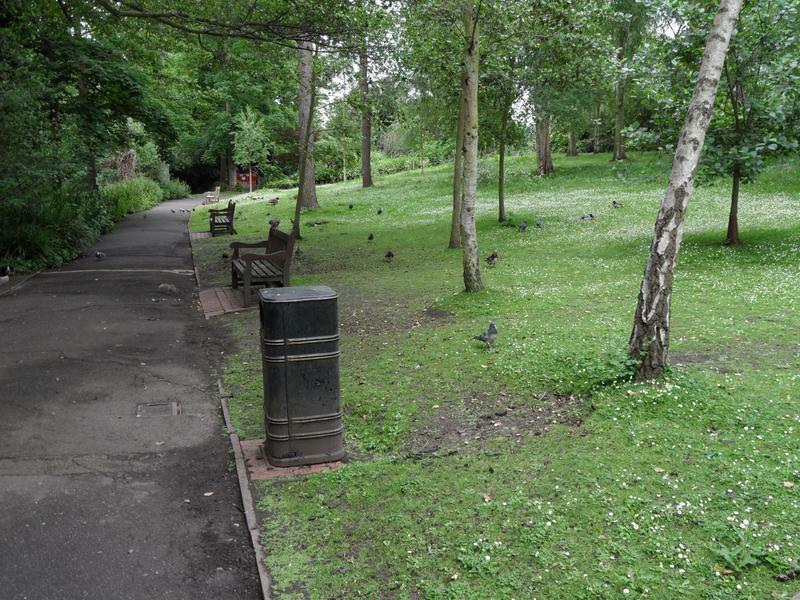 The western side of the park, a small animal can be seen walking along the path near the park bench. 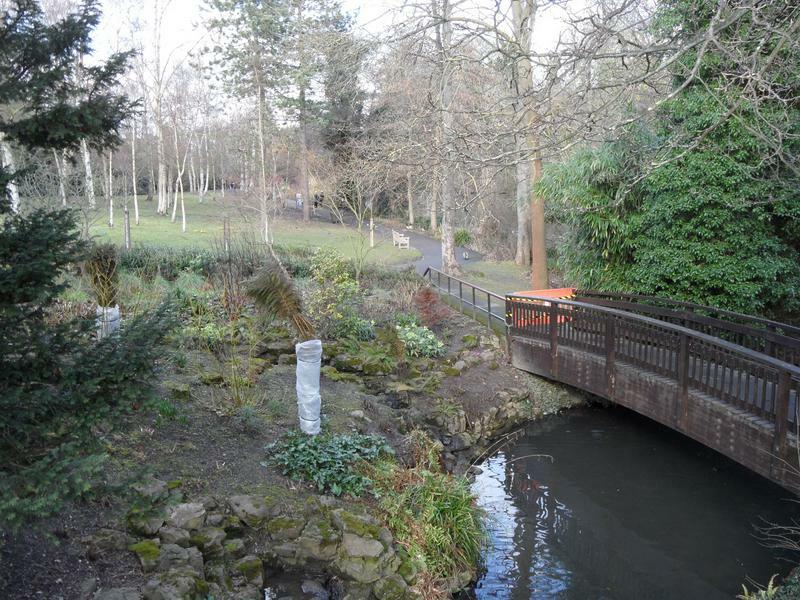 bordering the park. 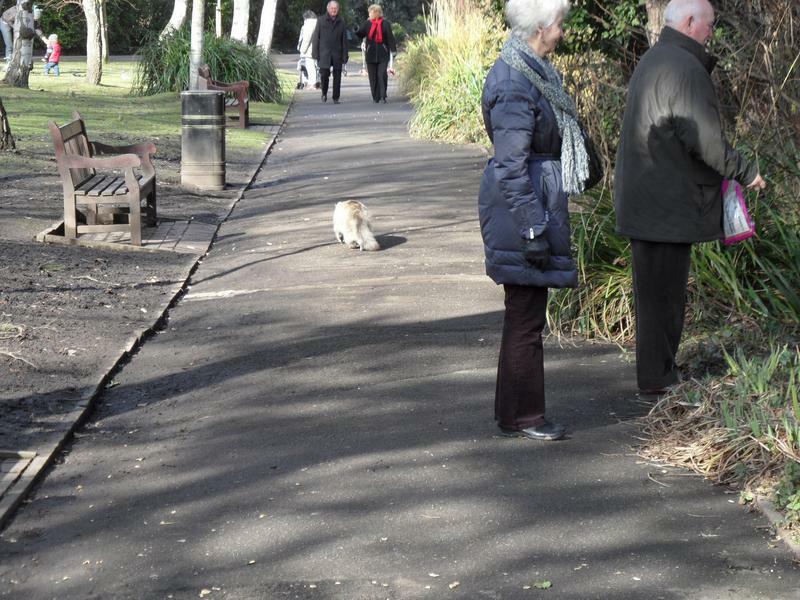 This is the path where Ivan waits to be fed, also squirrels are very tame here and come up right up to walkers. 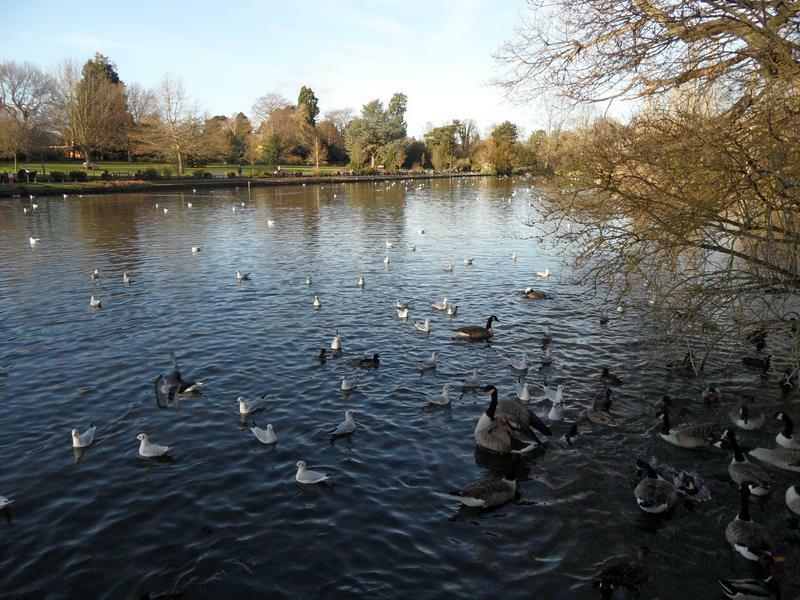 This is the lake where the Mandarins normally stay, but no sign of them this visit, just geese, Mallards and Coots. 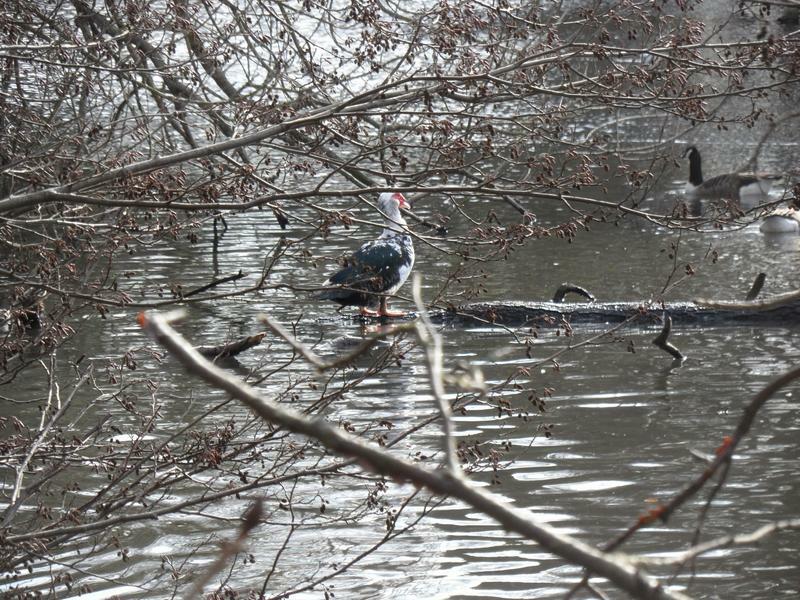 But Ivan the Muscovy duck is still here sitting on branch in the lake. 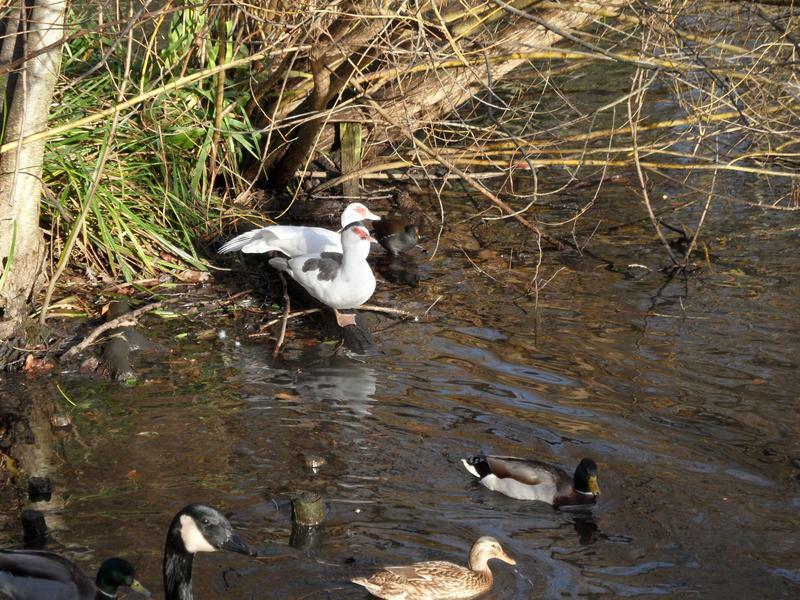 The main lake, domestic duck with yellow beak. 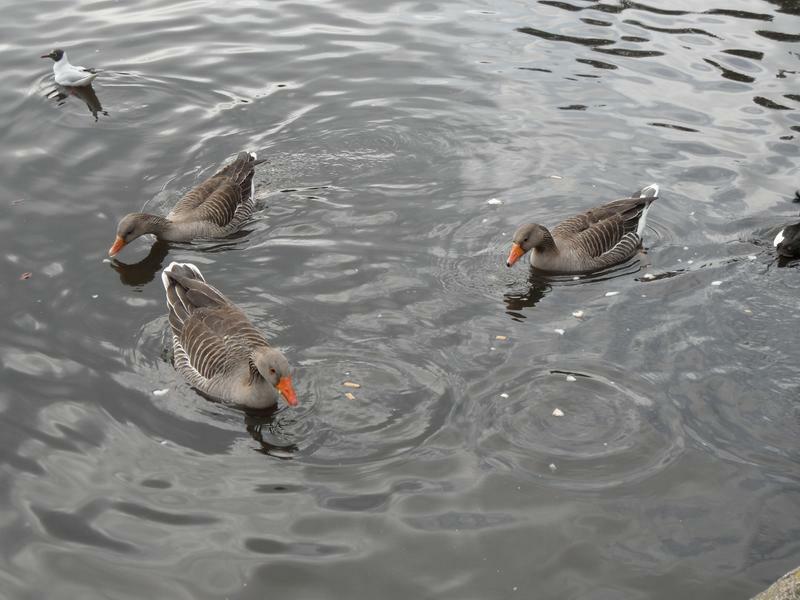 Greylag Geese waiting to be fed. 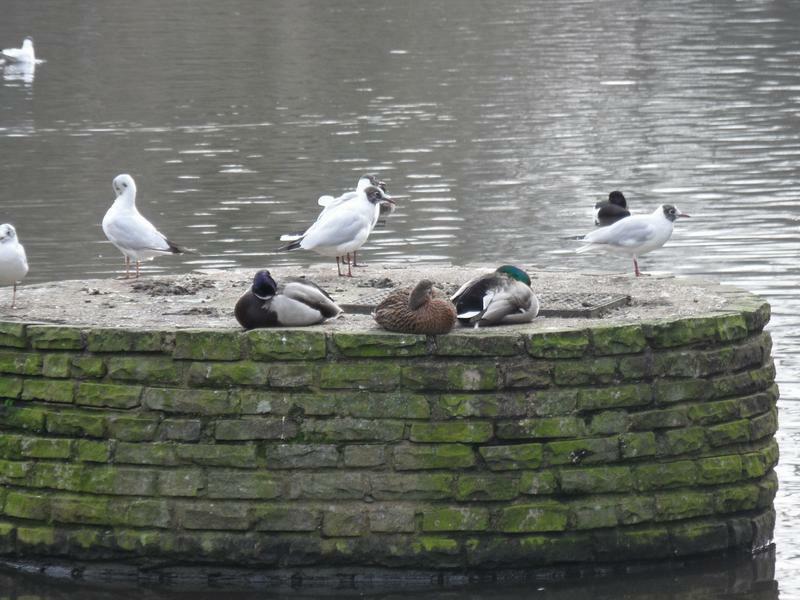 Three Mallards sleeping on an island, someone will need to put some nesting materials on the island if it's to find better use. 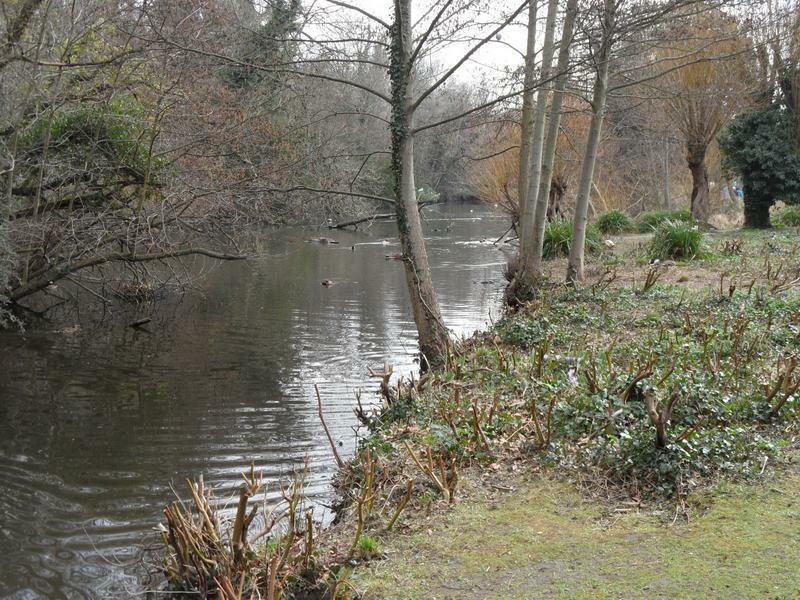 11th March 2012, just one Mandarin Duck, with a Coot in the foreground. 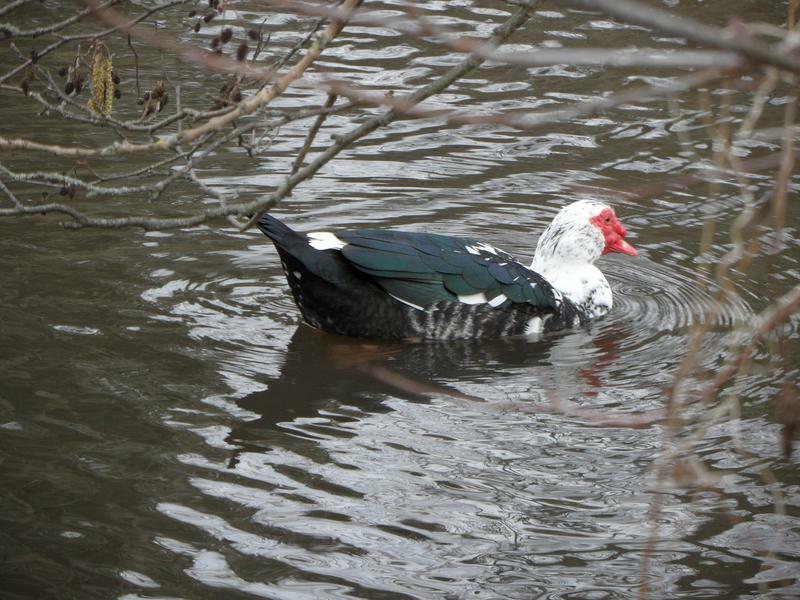 Ivan the Muscovy duck on the water this visit. 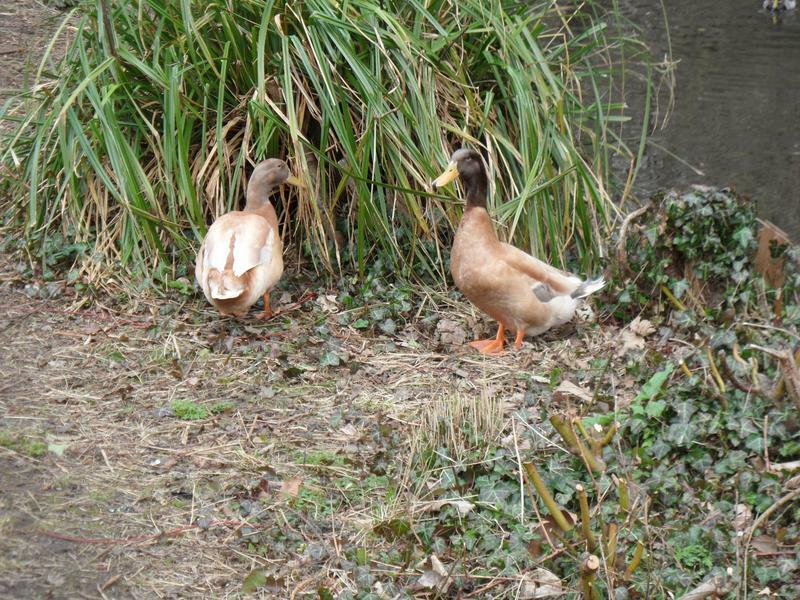 Not sure about this pair of ducks, they look like Mallards but much lighter in colour than normal. 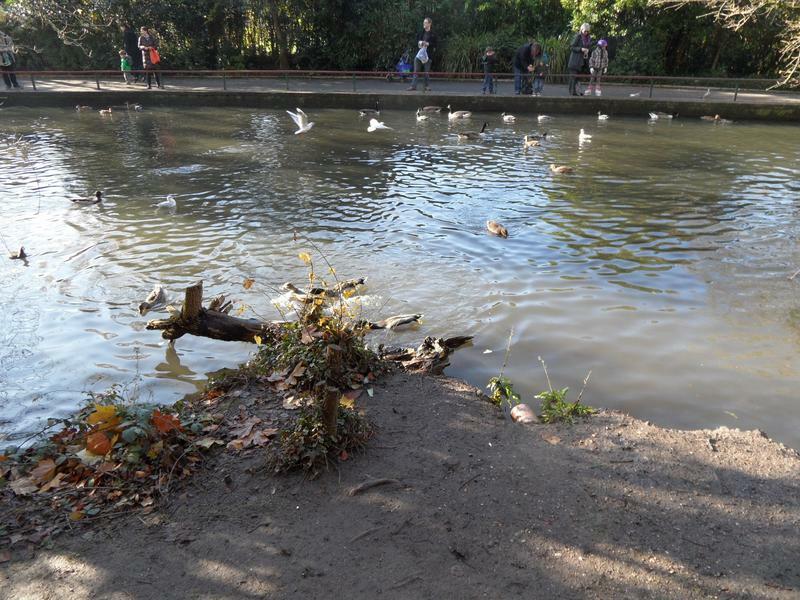 Perhaps Appleyard Ducks? 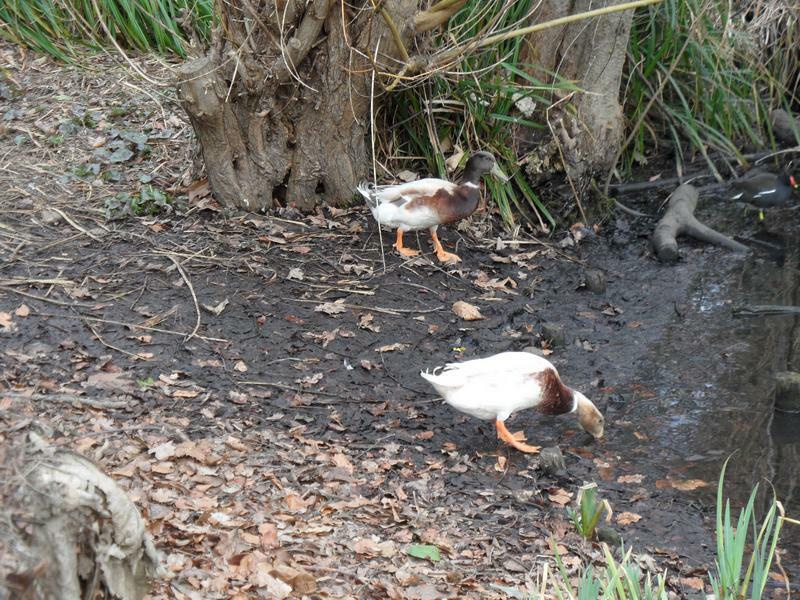 The strange Mallards again, one I could accept, but two with similar strange colourings seems very odd. 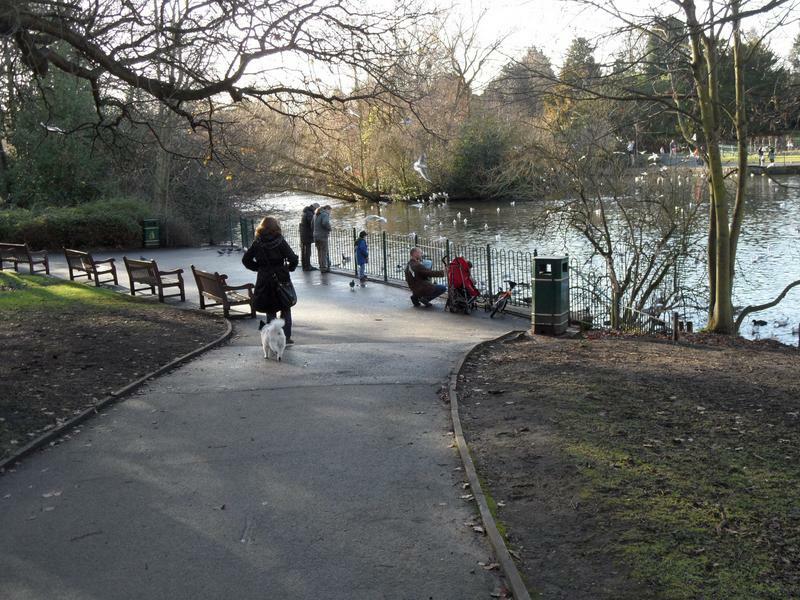 One of the central lakes in the park. 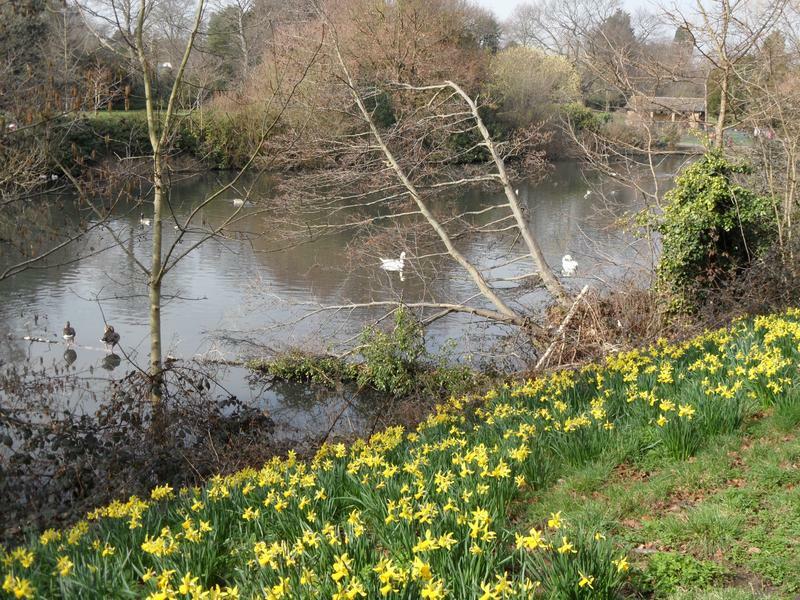 Daffodils planted by the edge of the lake, with two swans. 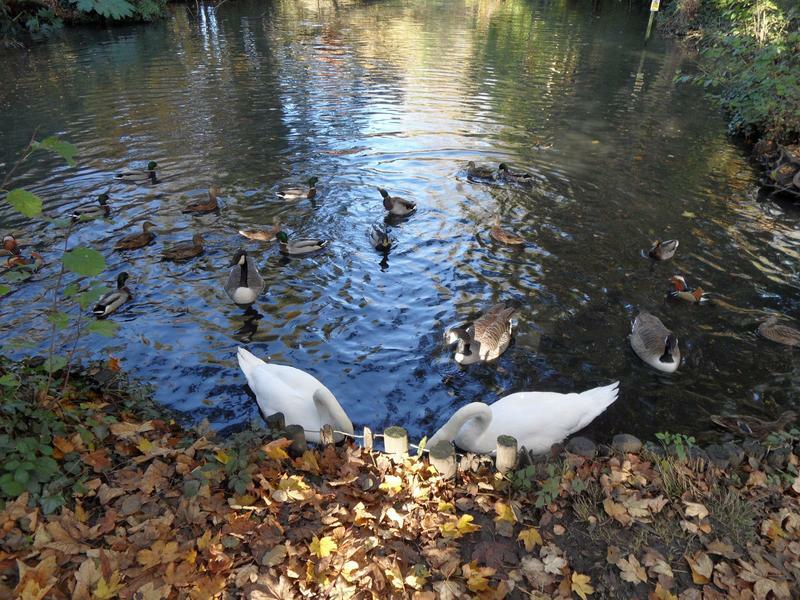 The swans again heading this way for food. 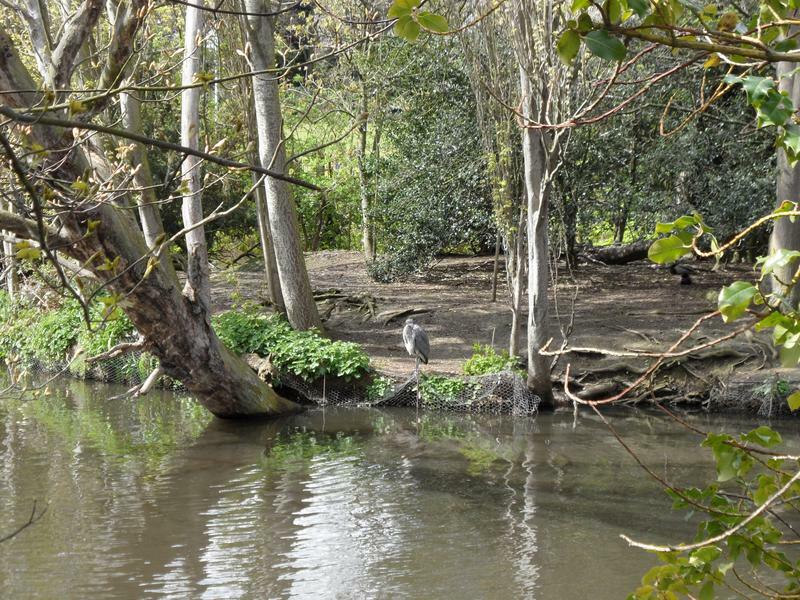 22nd April 2012, a heron looking for lunch in the water. 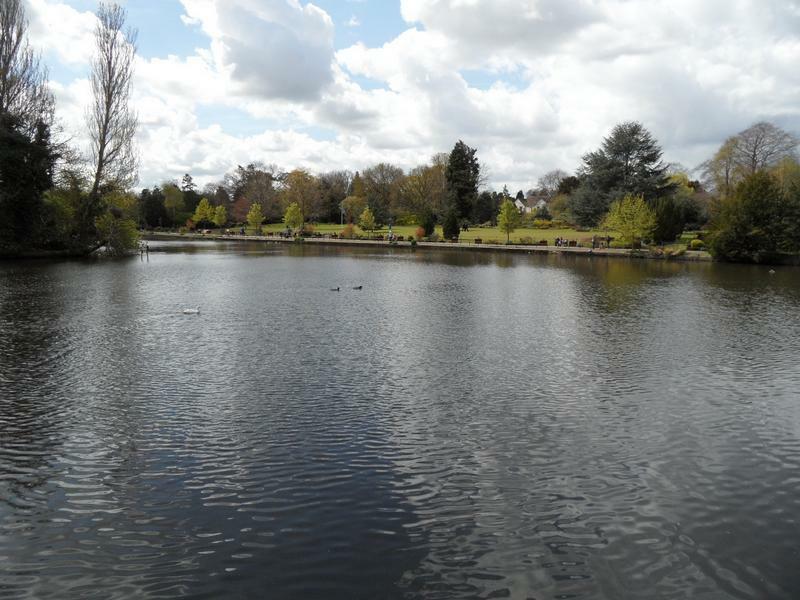 The main lake is very quiet, all the winter sea birds have flown away for the summer. 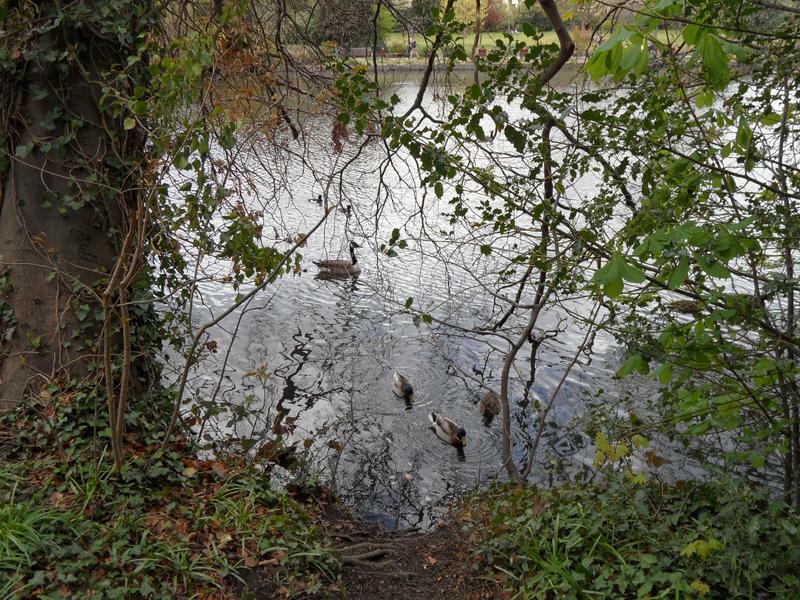 Various Mallard pairs can be found around the edges of the lake, keeping away from each other. 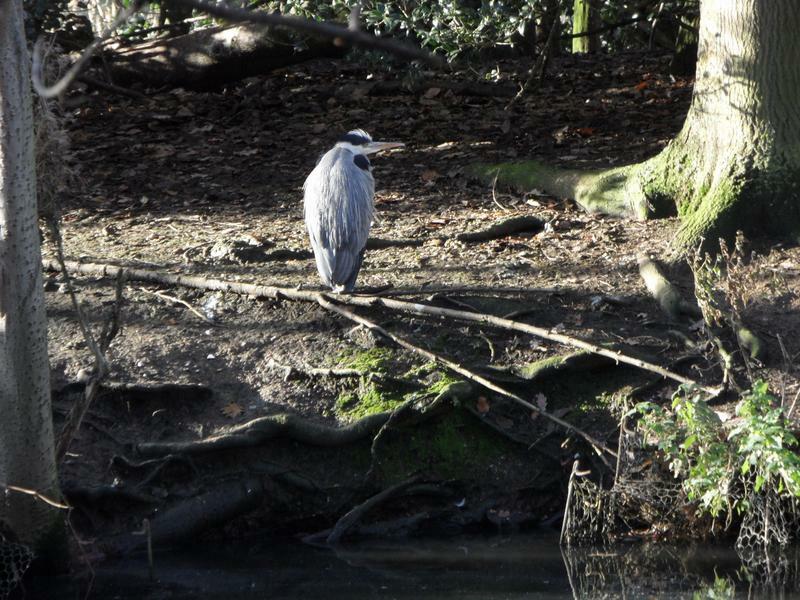 Another heron on the island. 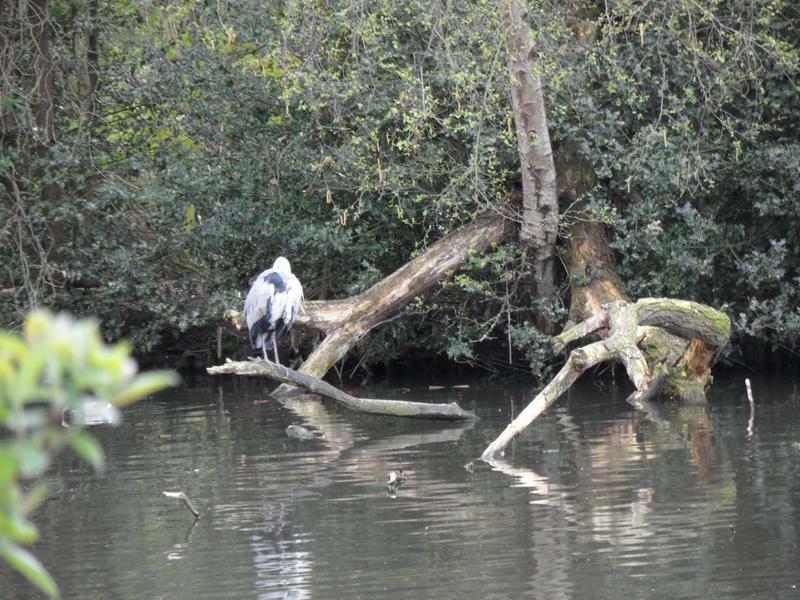 Yet more herons watching the lake. 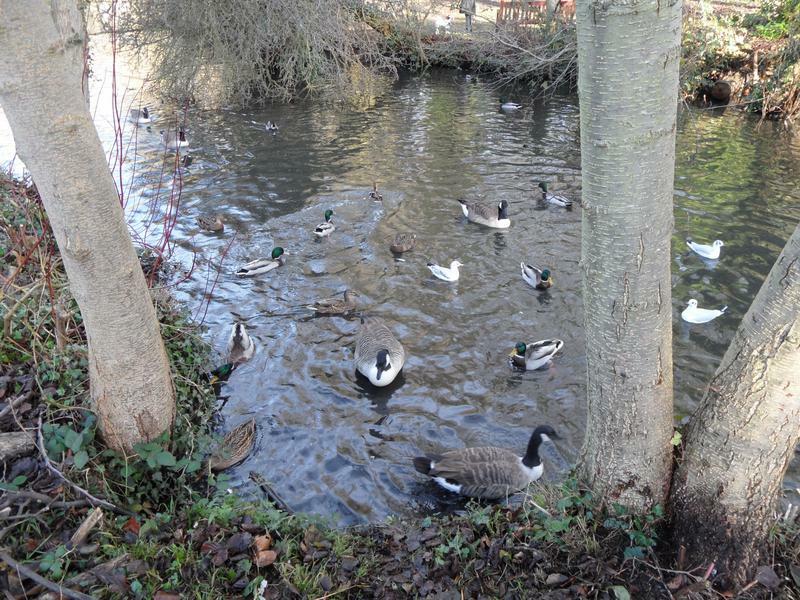 Very few ducks and geese to feed today, hopefully many sitting on nests. 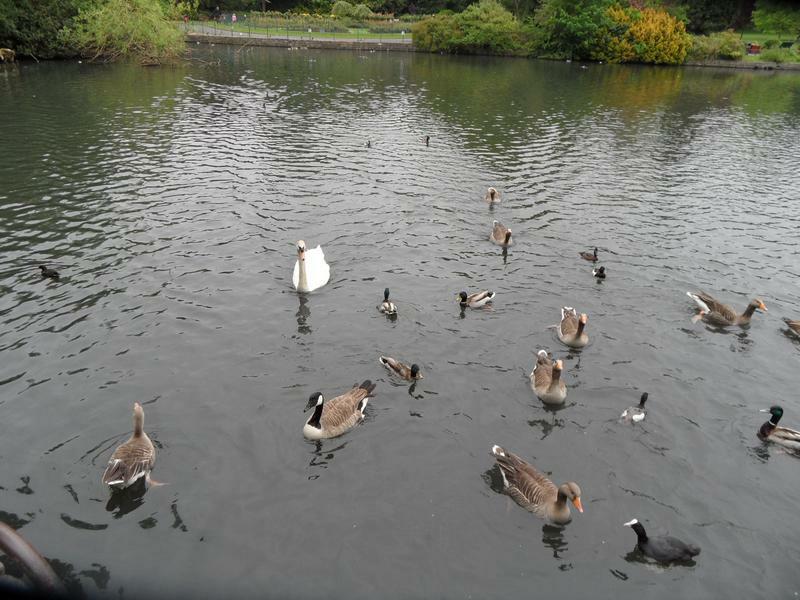 2nd June 2012, the lake is quite busy, three swans, Greylag and Canada Geese, Coots and Mallards. 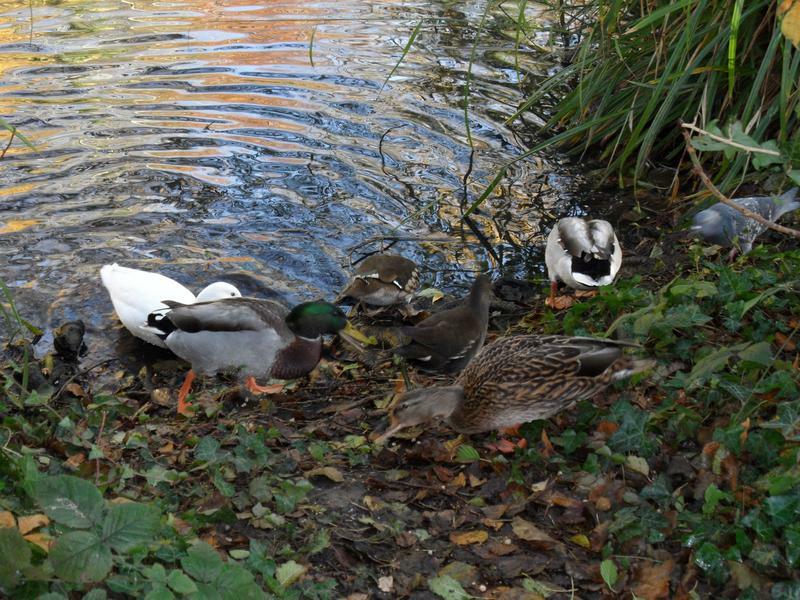 The male Mallards are loosing their grey feathers and turning mottled brown similar to the females. 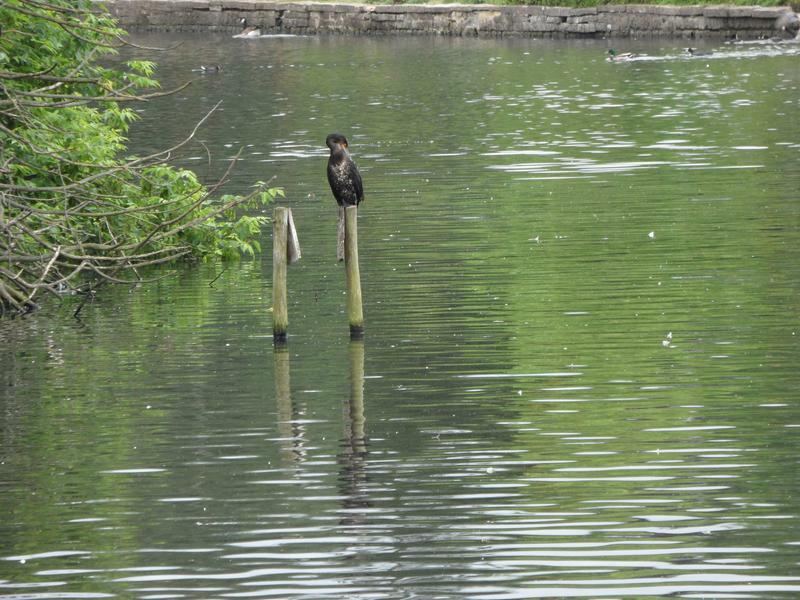 A Cormorant balancing on the post, looking for fish. 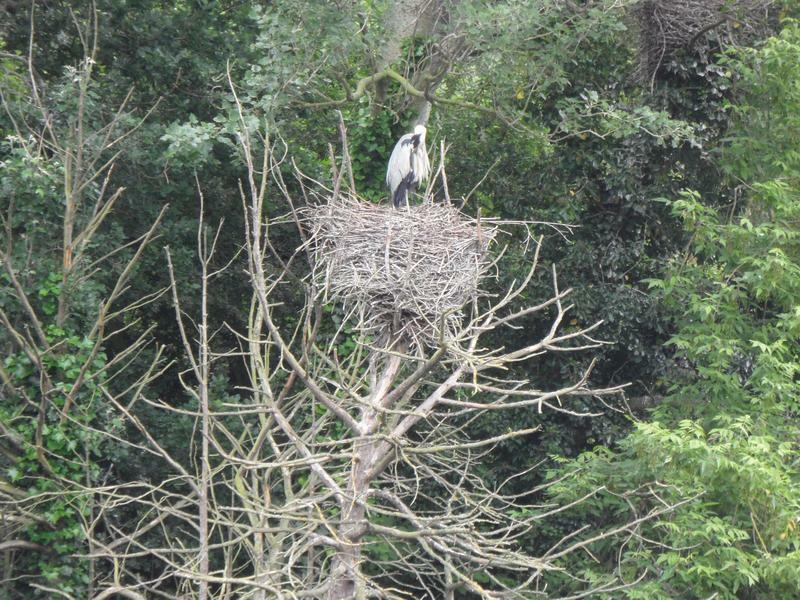 A massive heron nest, looks about five feet across, must have been a major effort to collect so many branches and twigs. 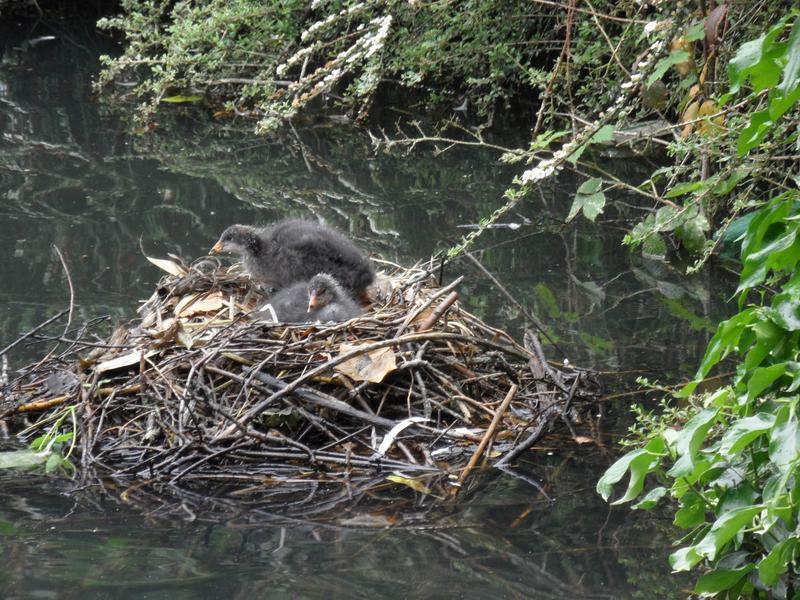 Two young Coots on their nest. 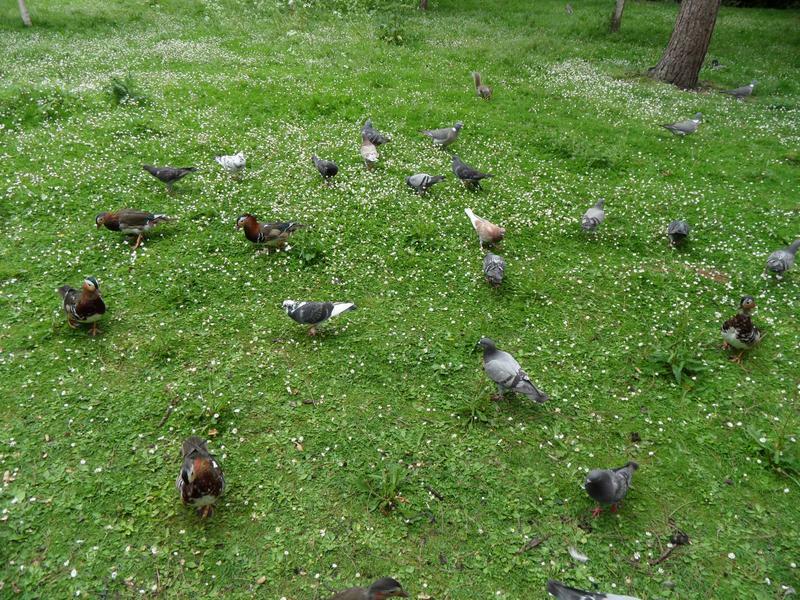 All the Mandarin ducks seem to be on the grass today, and just like the Mallards they are losing their striking colours and feathers. 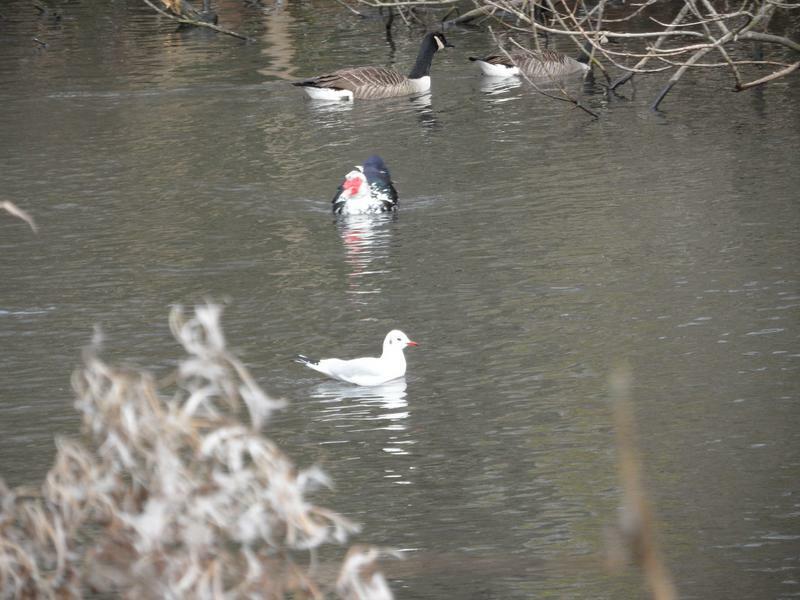 The two in the foreground look smaller without the red neck feathers. 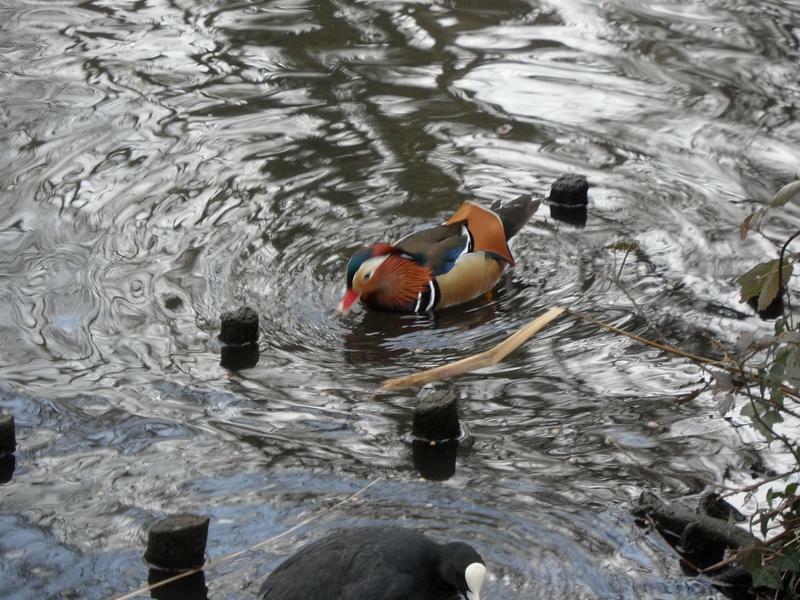 More male Mandarin ducks, there was a single female here as well. 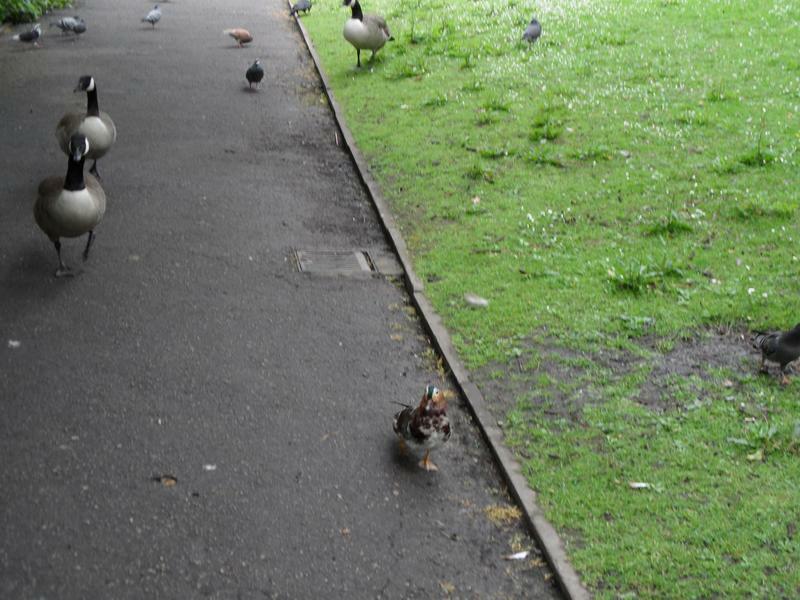 And they were all very hungry, one of the Mandarins is following me down the path. 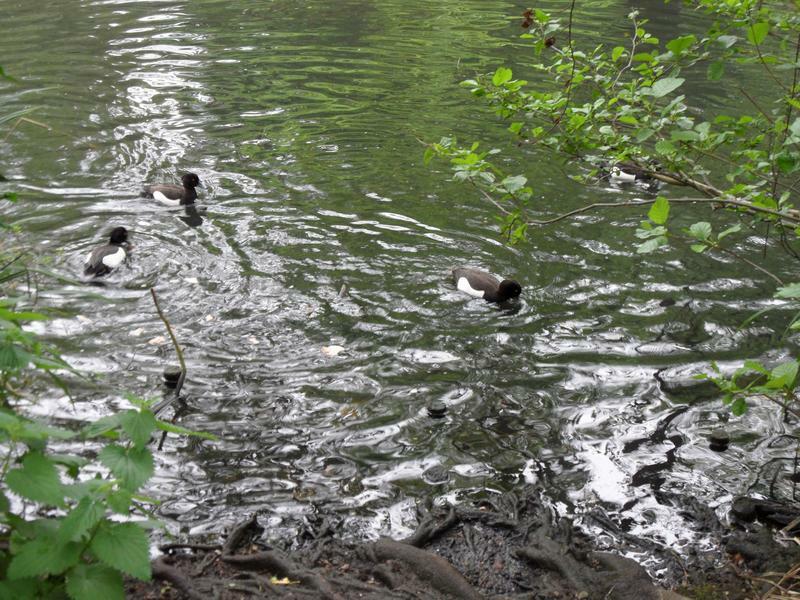 Four tufted ducks on the lake. 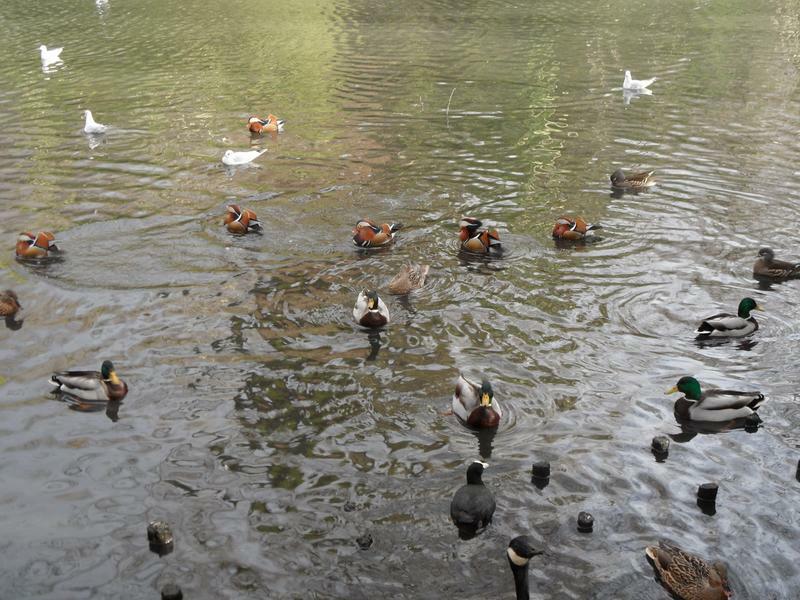 The Mandarins are still following, some Mallards on the grass don't seem hungry. 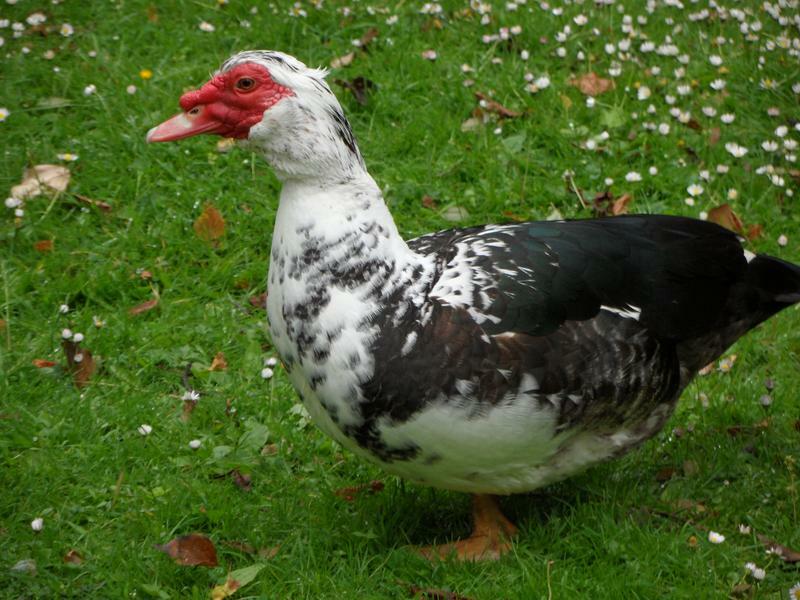 Higher up this grass bank, Ivan the Muscovy duck was sleeping until I got too close. 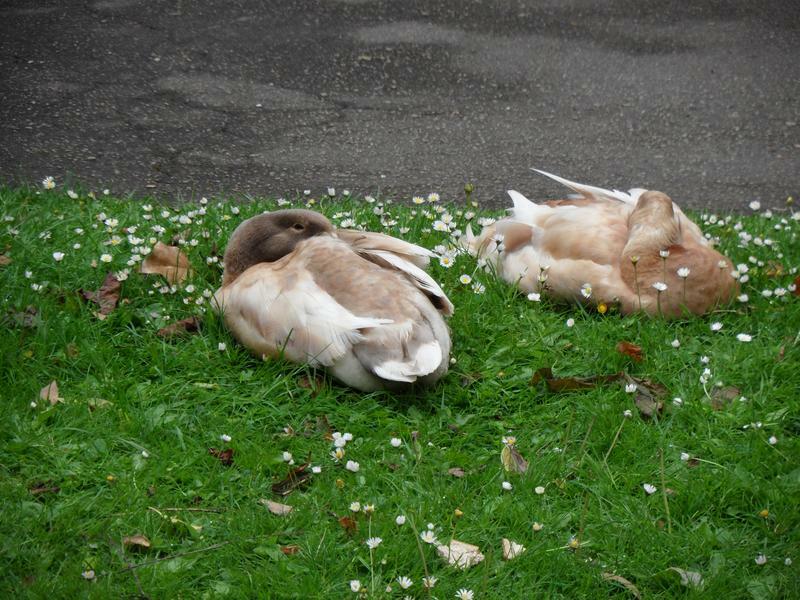 Ivan was sleeping next to this pair of Greylag Geese, who ignore me. 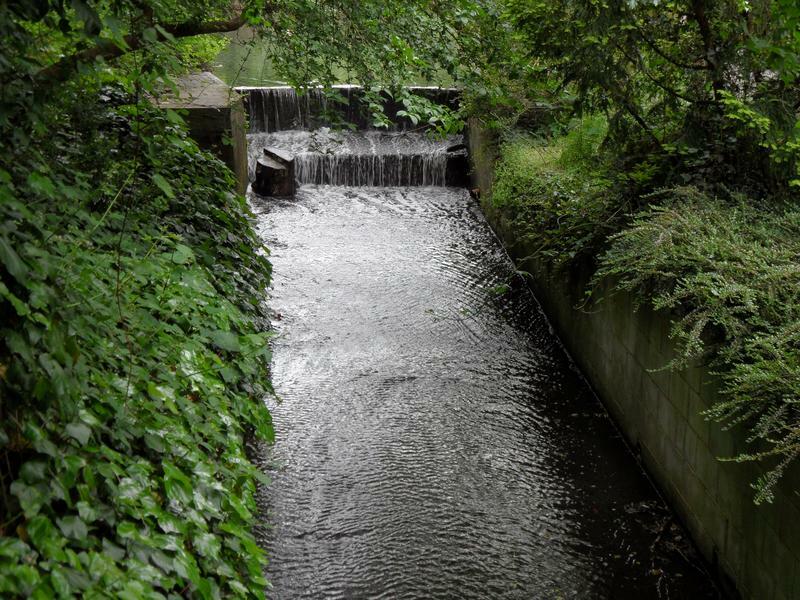 A good flow of water leaving the lake. 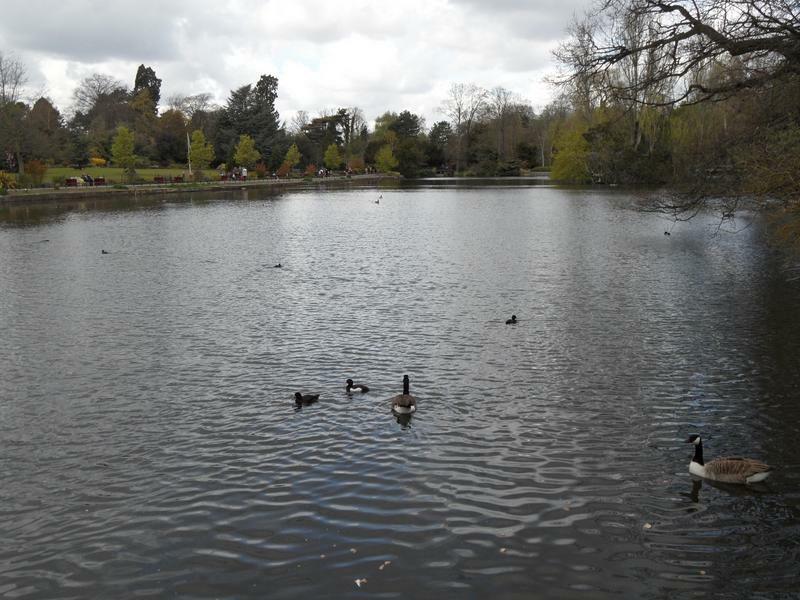 At the top of the lake, we see the only ducklings in the park, just two Mallards, swimming wildly around ignoring their mother. 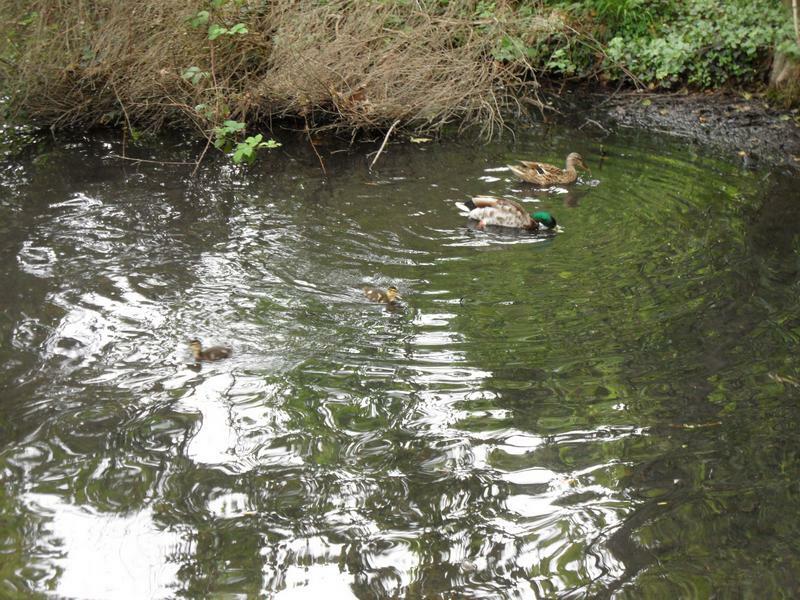 The two ducklings have followed us around the corner with their parents. 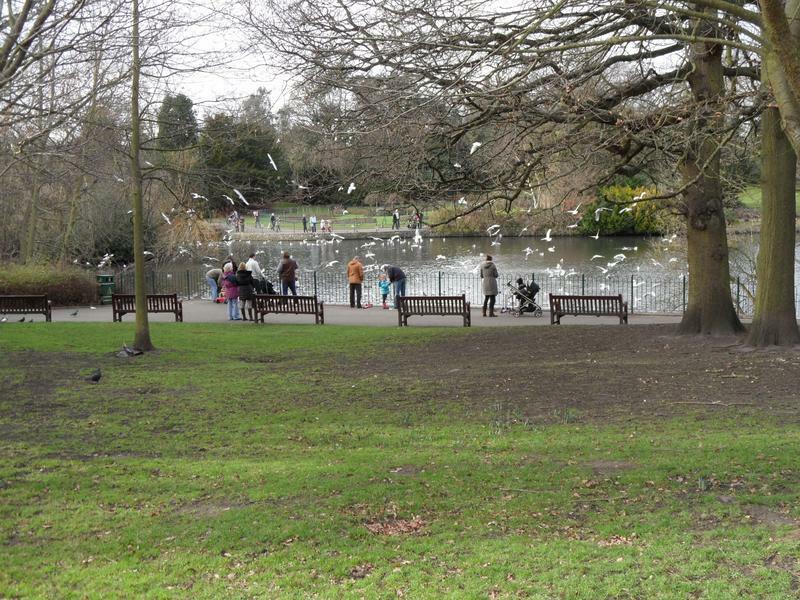 There are a lot of tame squirrels in the park, looking for food, must remember to bring peanuts next time. 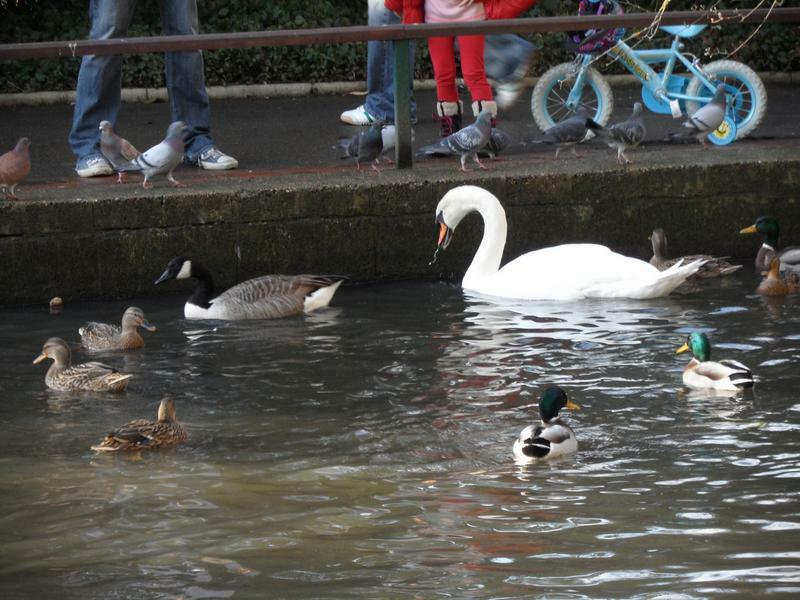 A wide variety of water fowl. 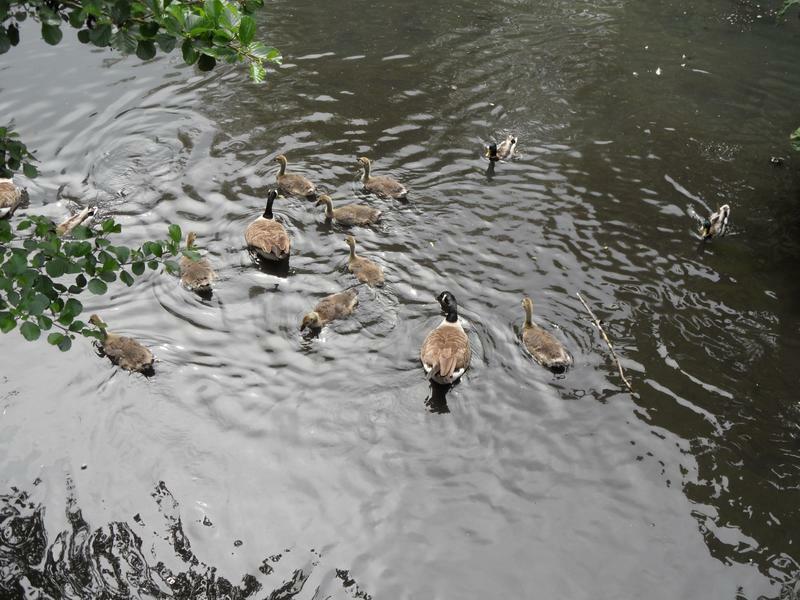 At the southern end of the park, there is a family of Canada Goose goslings. 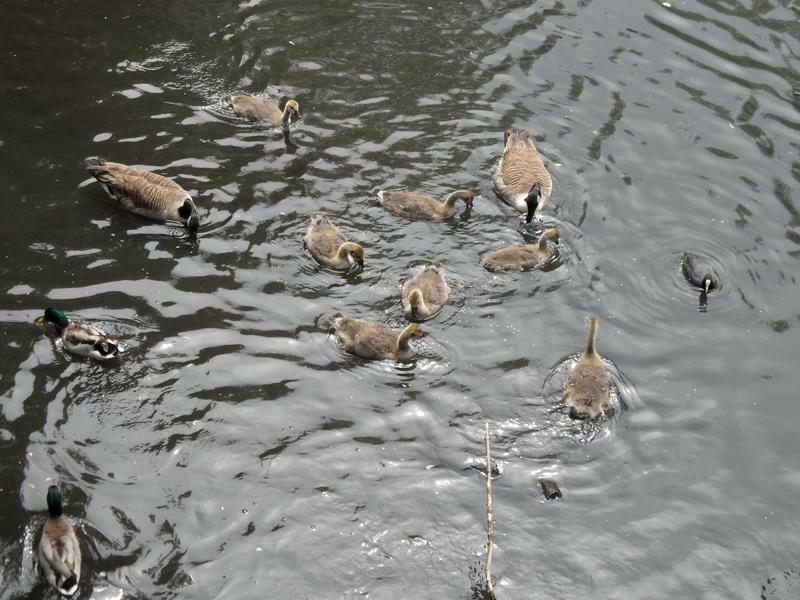 Eight hungry goslings, probably one month old. 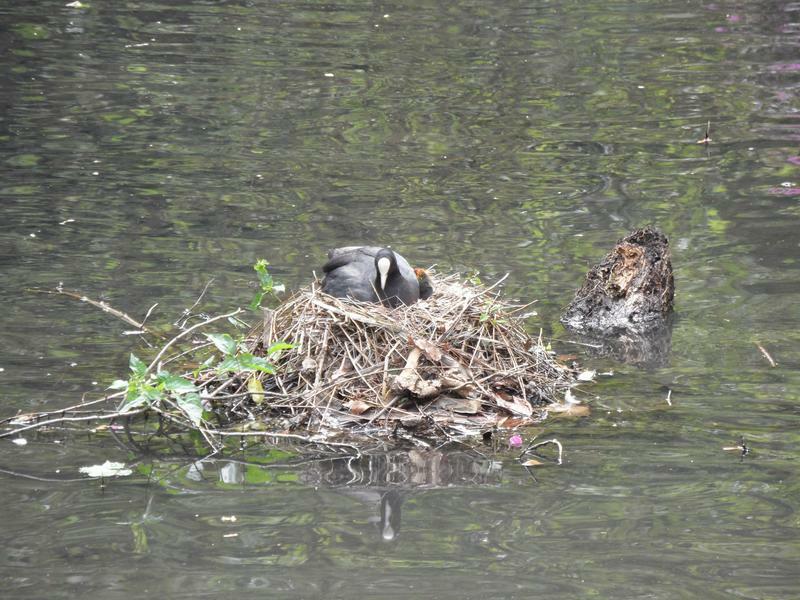 A Coot sitting on her next with a chick just behind her. 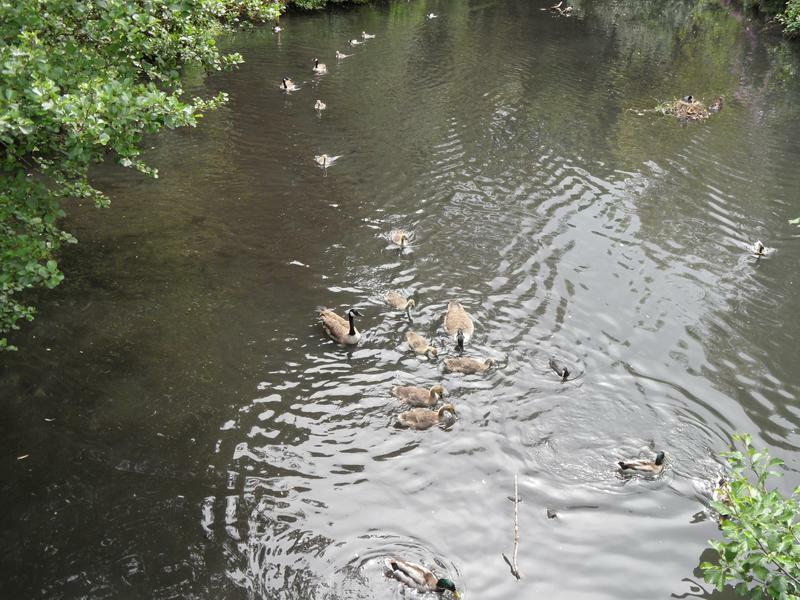 All food eaten, the goslings head off. 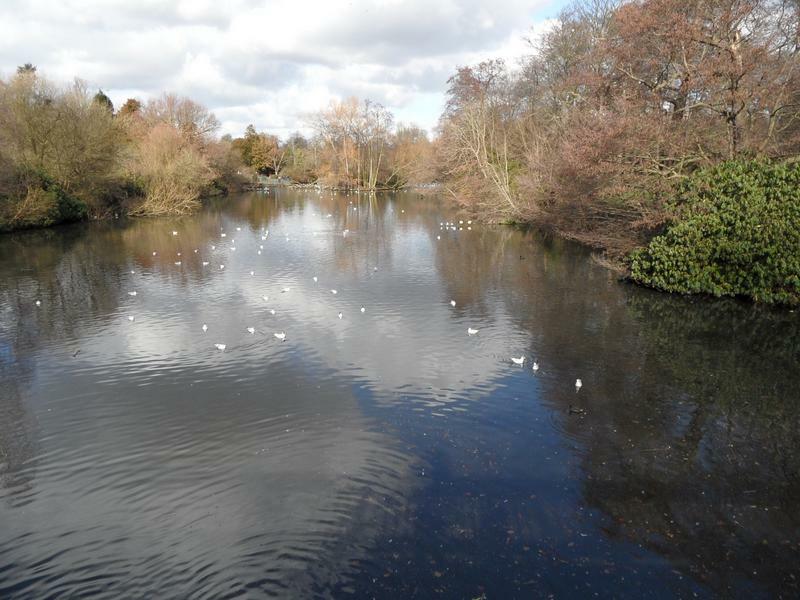 View from the high bridge up the main lake. 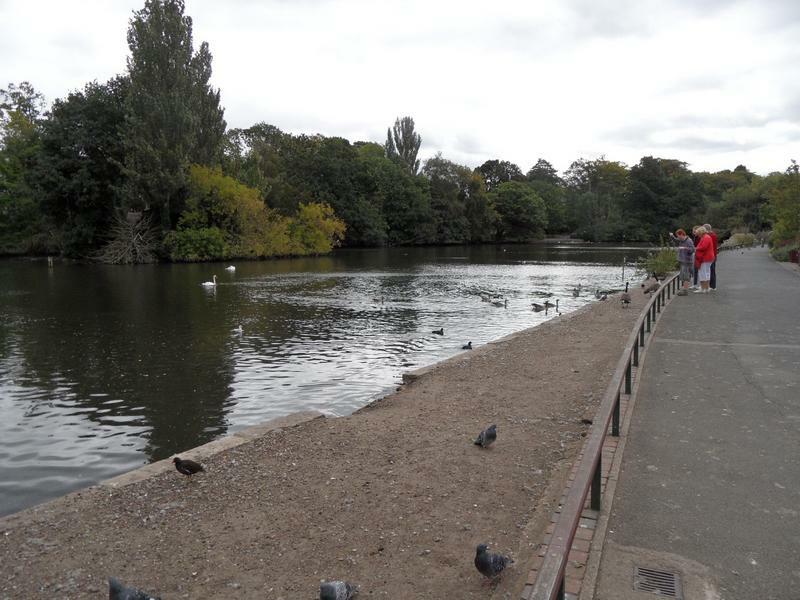 September 2012, a long time since any new photos, since I forget the camera on our last visit. 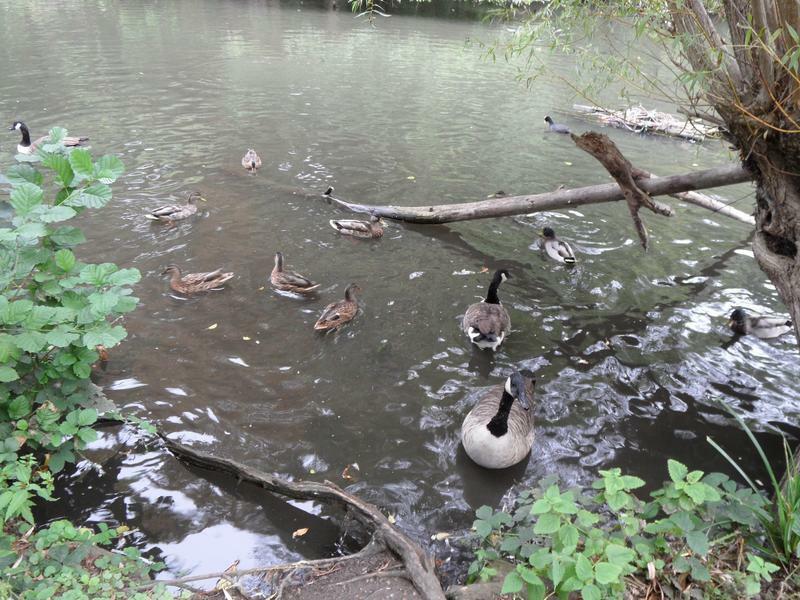 Plenty of Canada Geese here. 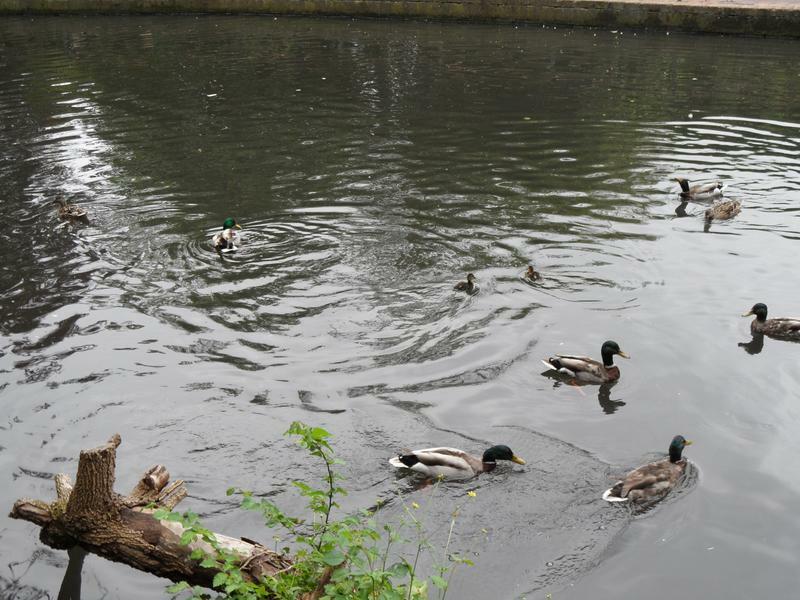 Still some Mallard ducklings around, now fully grown. 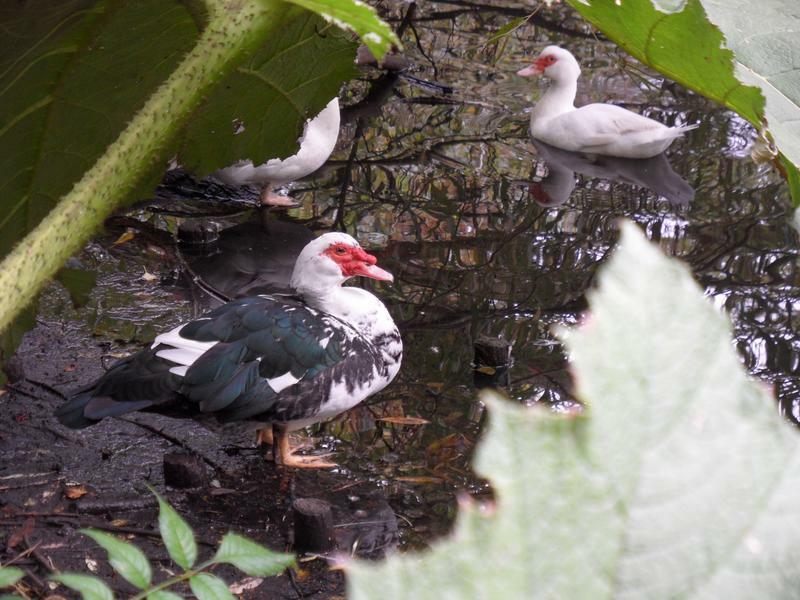 Ivan the Muscovy duck, with a pair of White Muscovy ducks. Wonder if they are related? 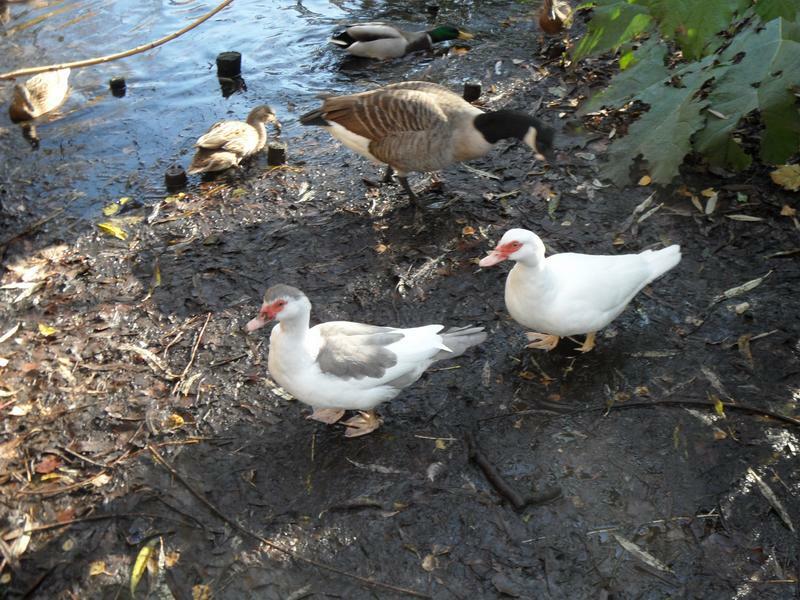 The White Muscovy ducks are much smaller than Ivan. 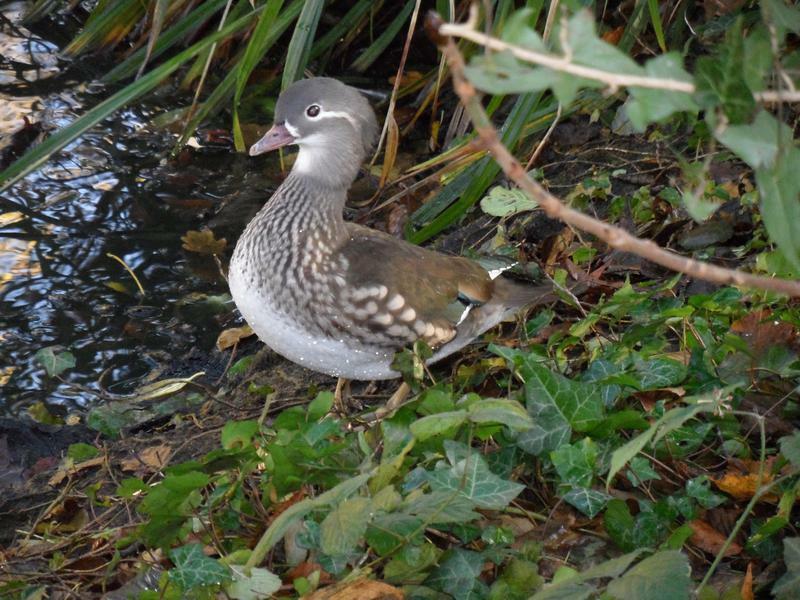 A Mandarin duck, not sure if a female or duckling. 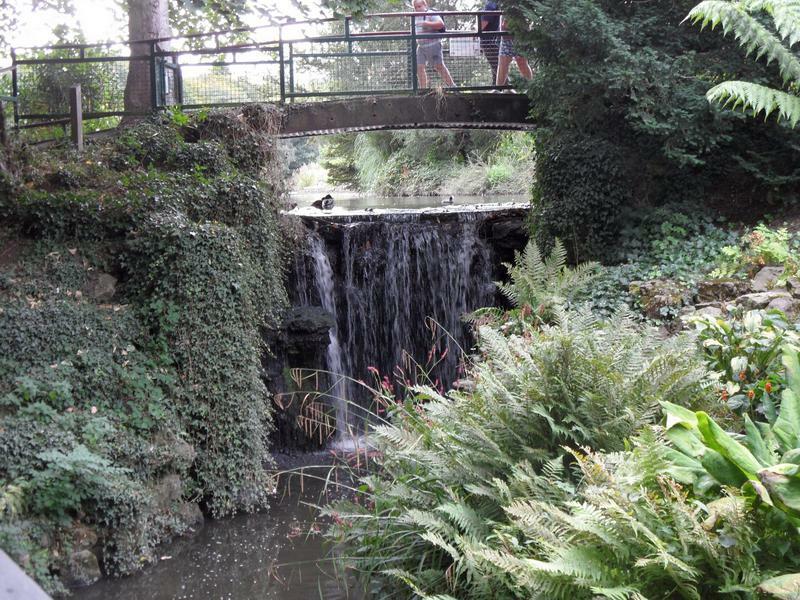 The waterfall from the main lake to the lower lakes. 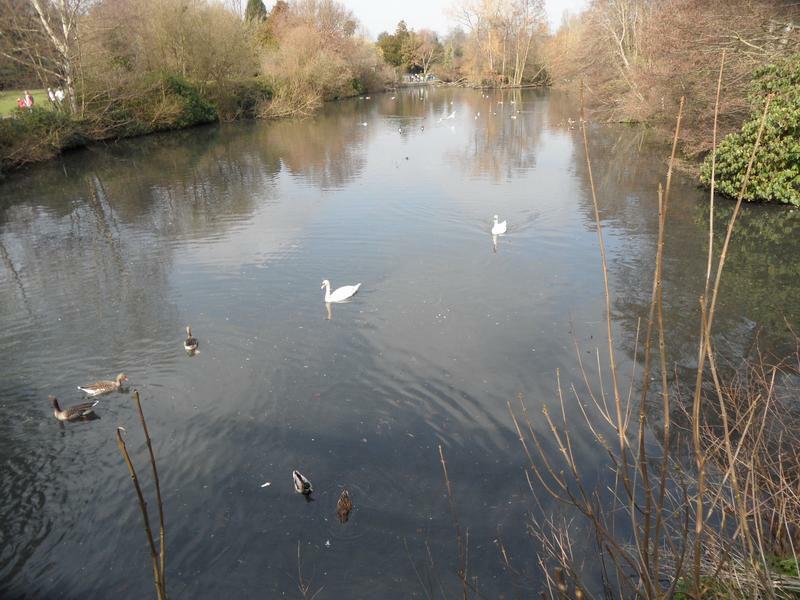 Pair of swans on the main lake. 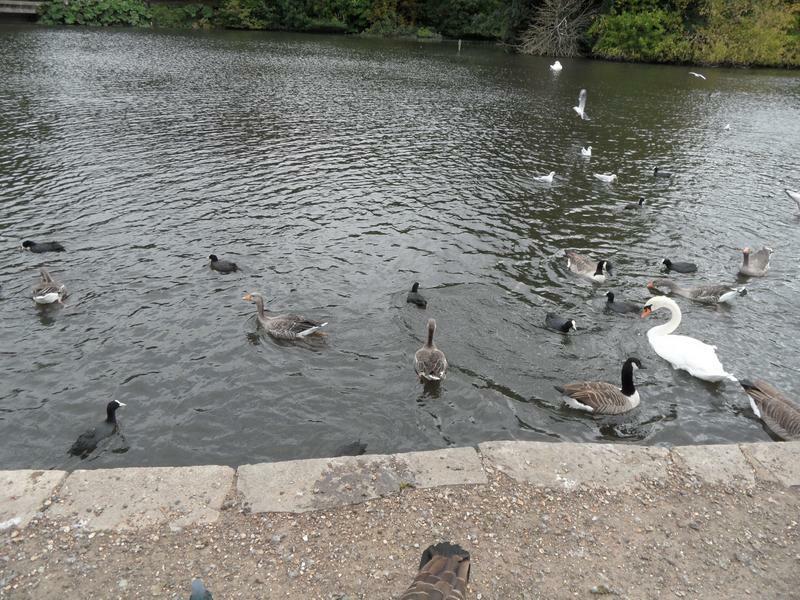 Good mix of Greylag and Canada Geese, Mallards and Coots. 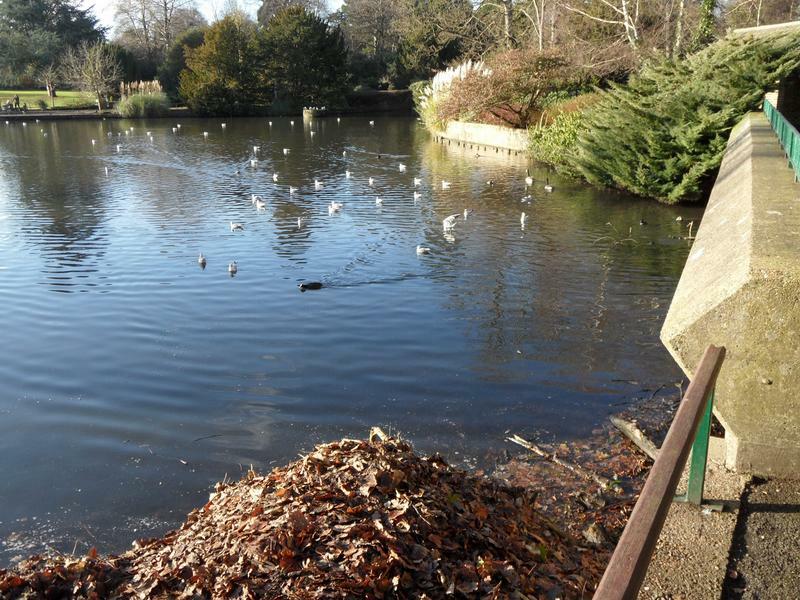 Same feeding area from the other side of the lake. 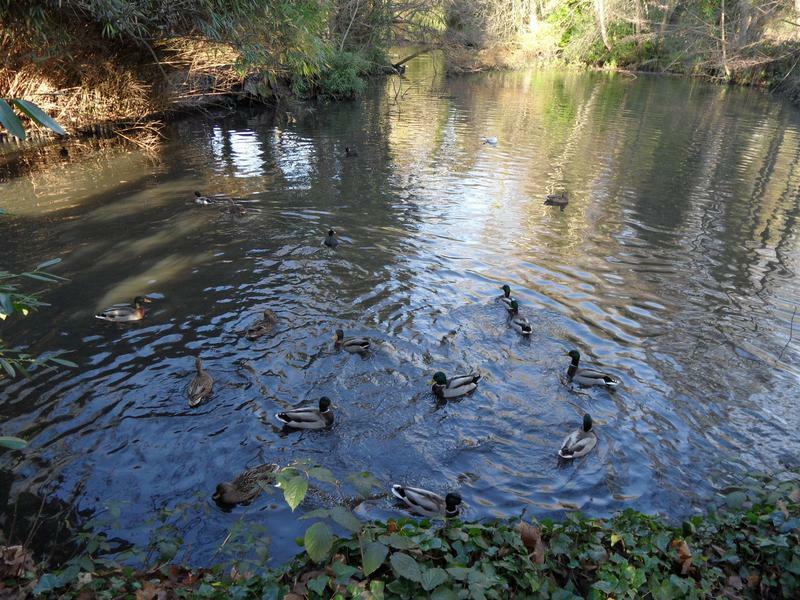 November 2012, lots pf hungry ducks and gesse on the northern most pond. 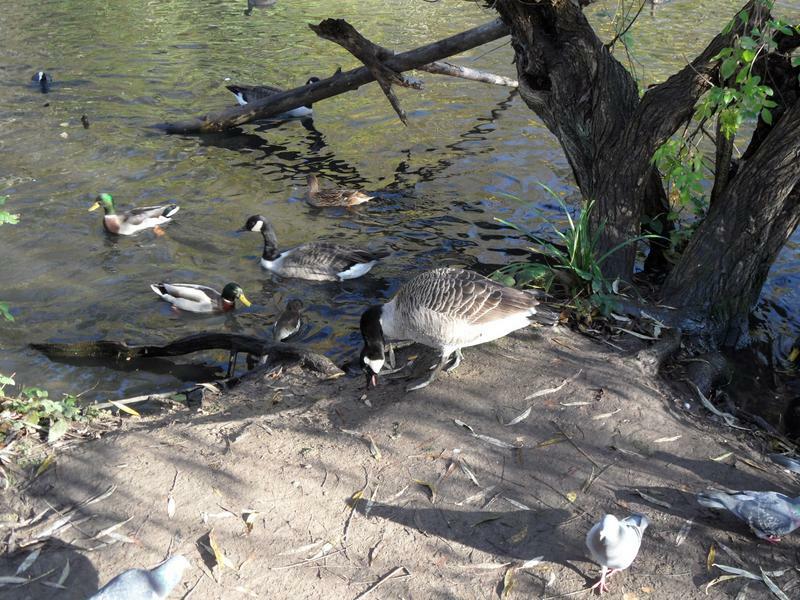 Canada Geese, Mallards and Coots on one of the beaches. 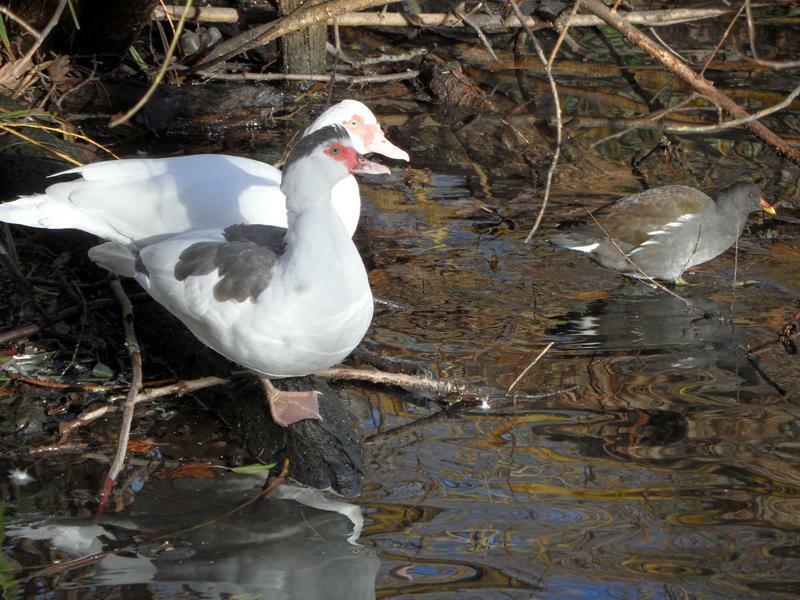 The pair of young White Muscovy ducks are still on the same beach as last month. They just follow each other around. 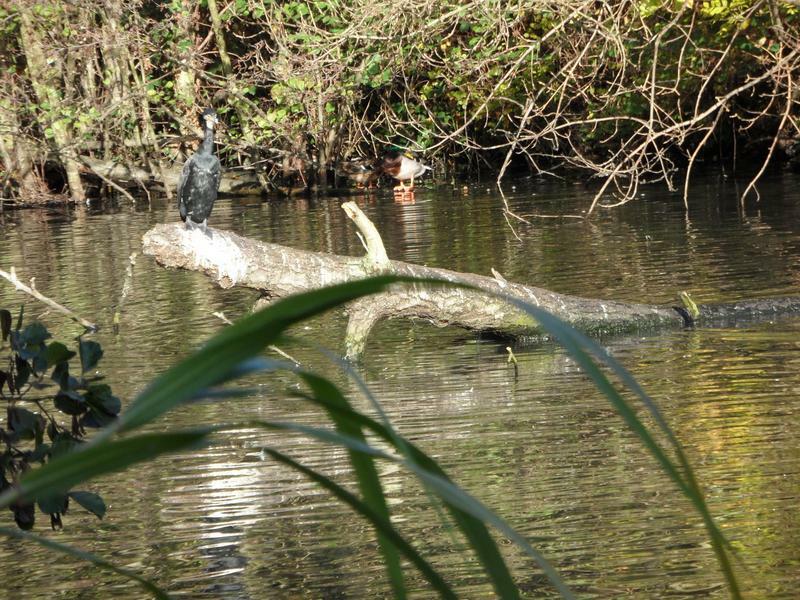 A Cormorant sitting on a branch in the lake, pair of Mallards behind. 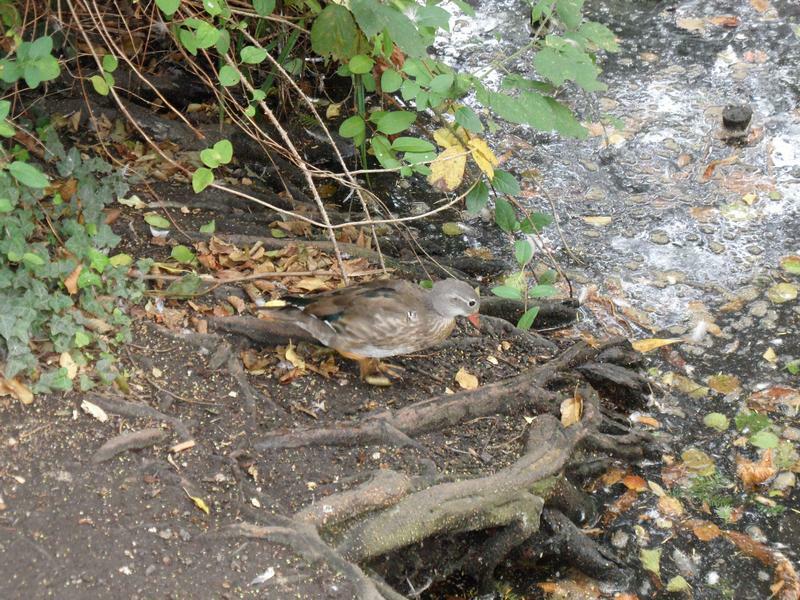 Probably a female Mandarin, could only be sure is swimming next to a boy. The femal Mandarin again with Mallards. 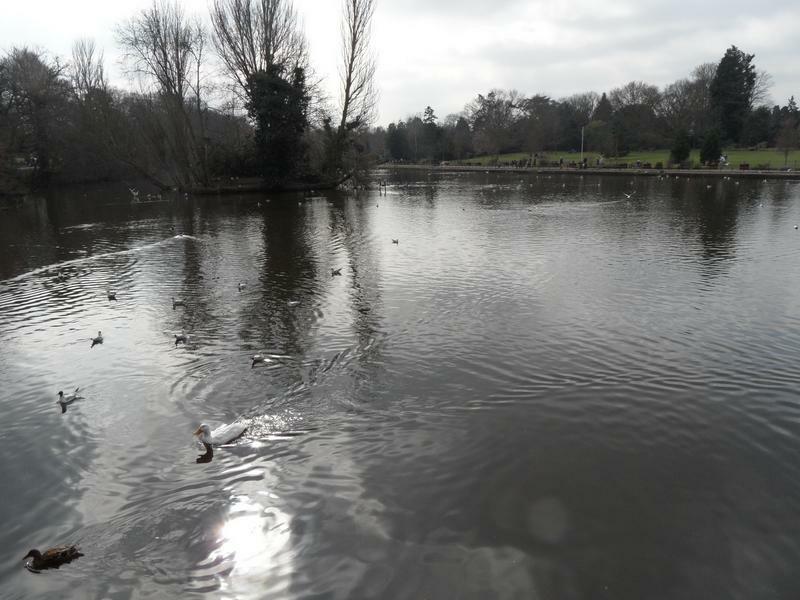 Pair of Mute Swans, both with their heads in the water (I was in a rush), also Mandarin Ducks left and right edges of the photo. 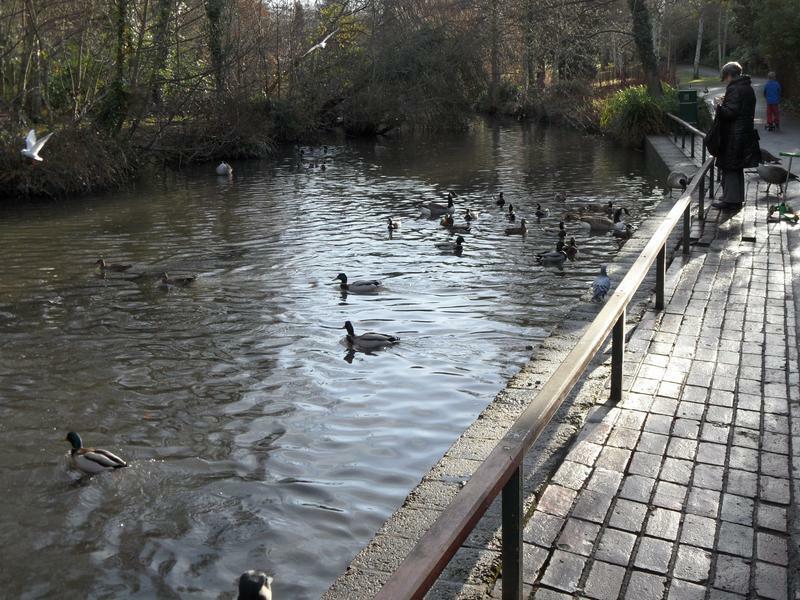 Back up at the northerly pond, still hungry but a steady stream of Sunday visitors to feed them. 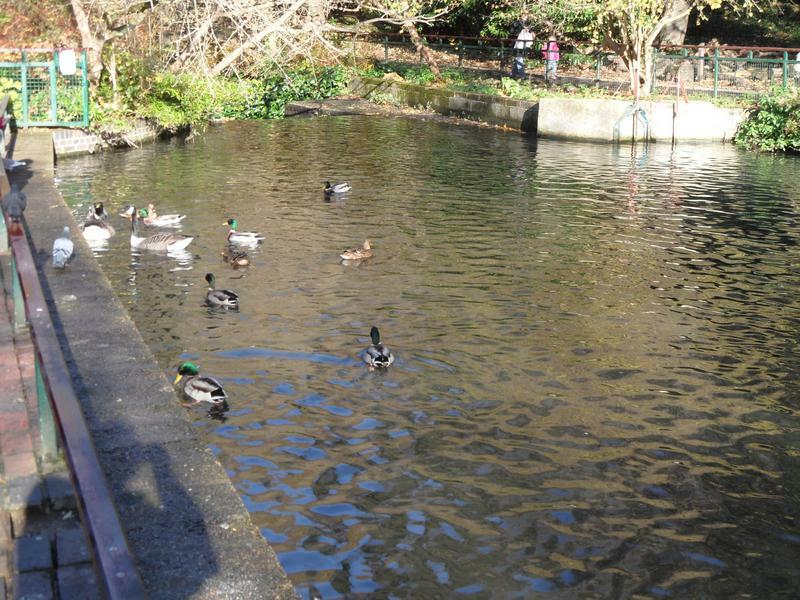 16th December 2013, mostly Mallards waiting to be fed. 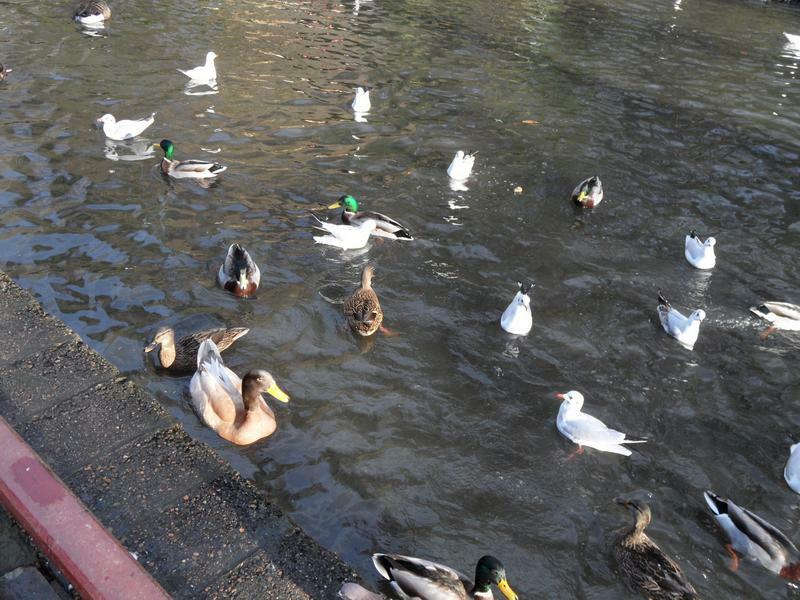 Although lots of gulls pounce on any food. 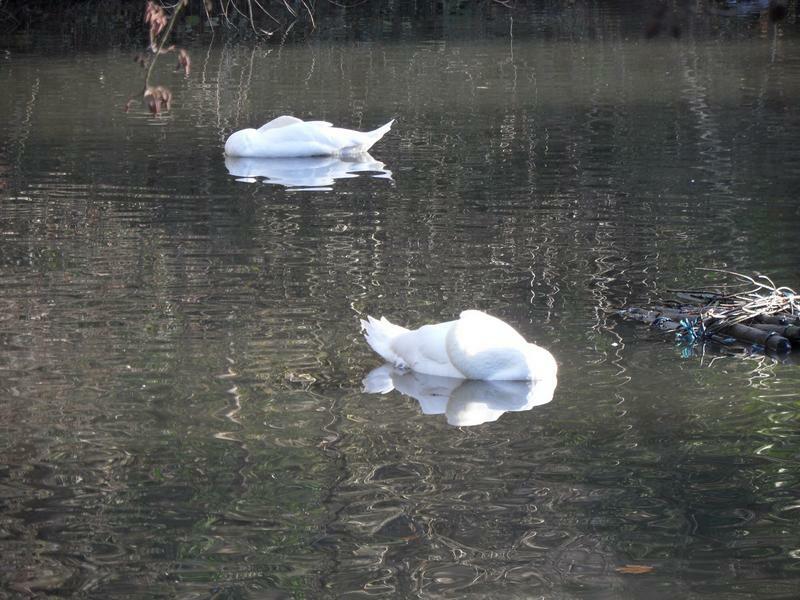 The two swans are asleep on the water. 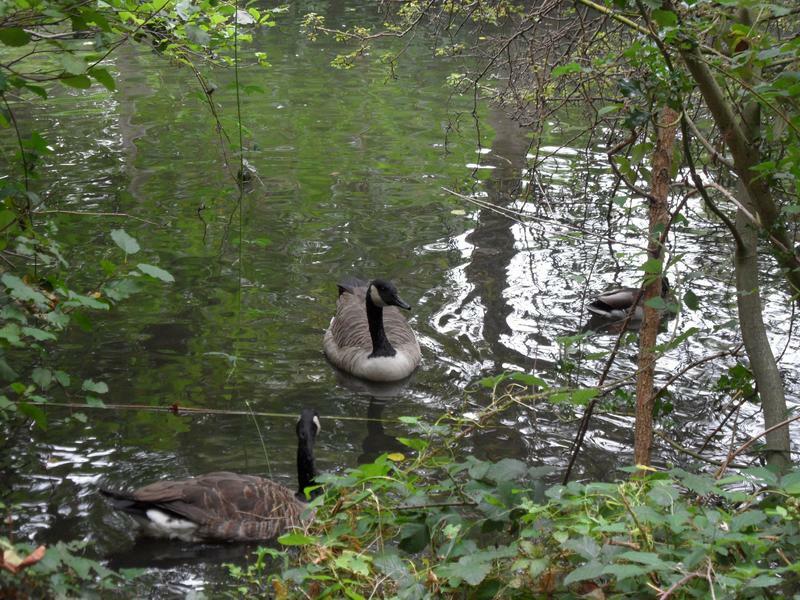 A few geese lower down the pond. 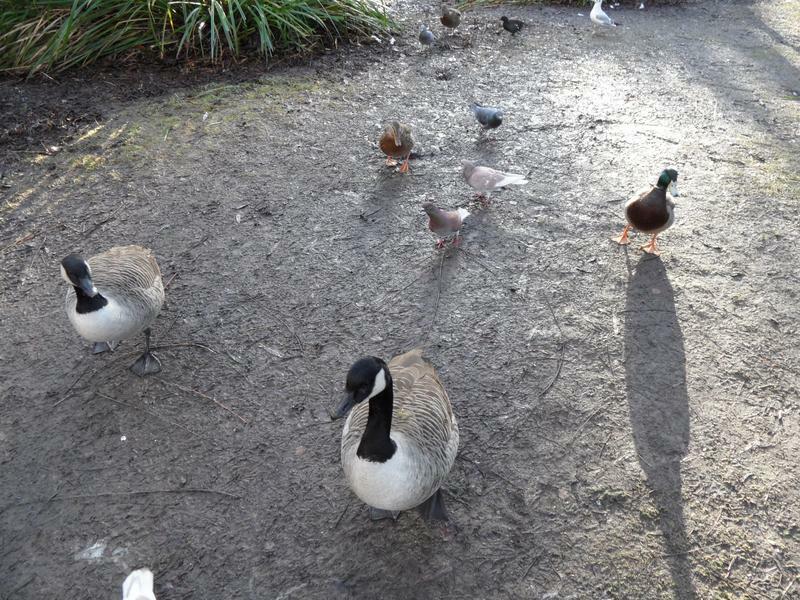 The ducks, geese and pigeons are now following me down the path, looking for food. 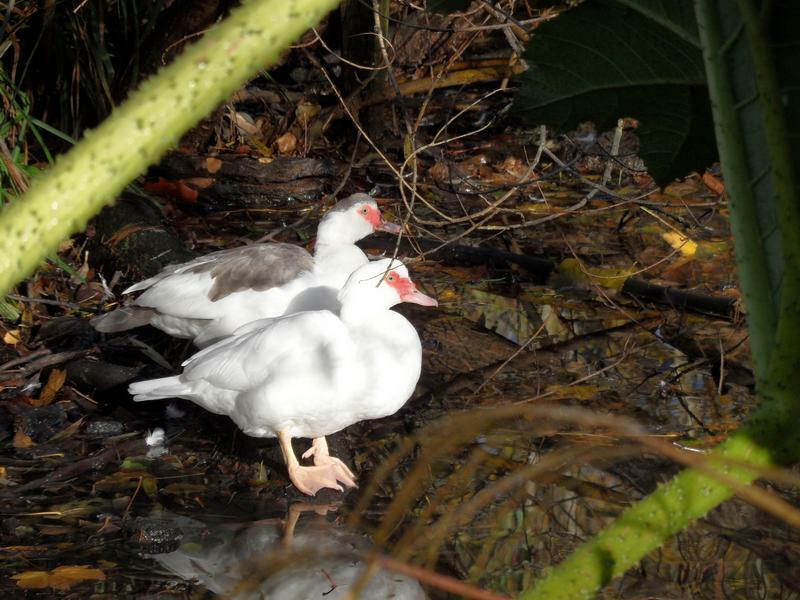 The young White Muscovy ducks on their usual branch. 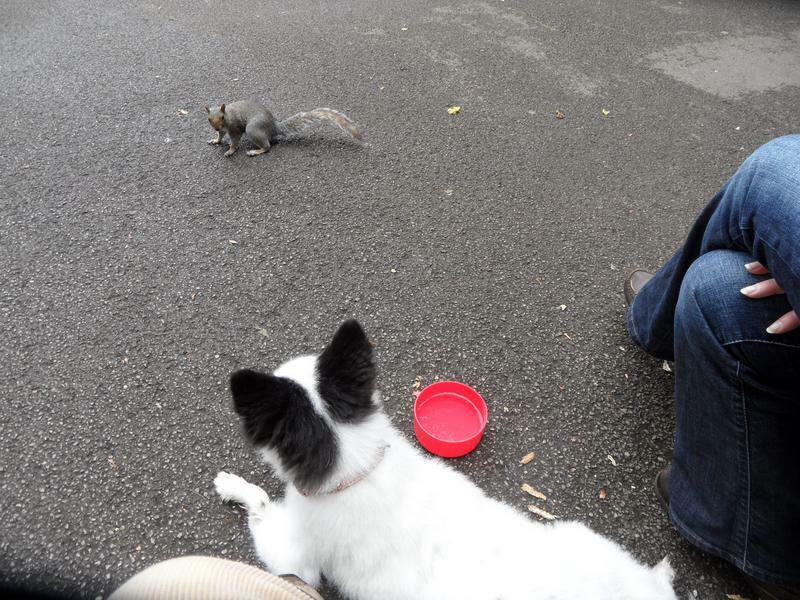 And again, rarely seem interested in food. 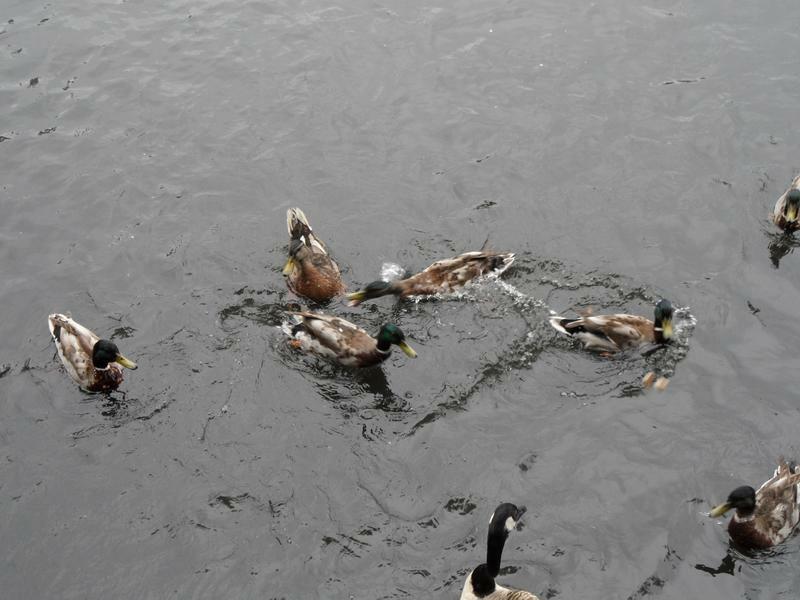 More Mallards on the smaller lake. 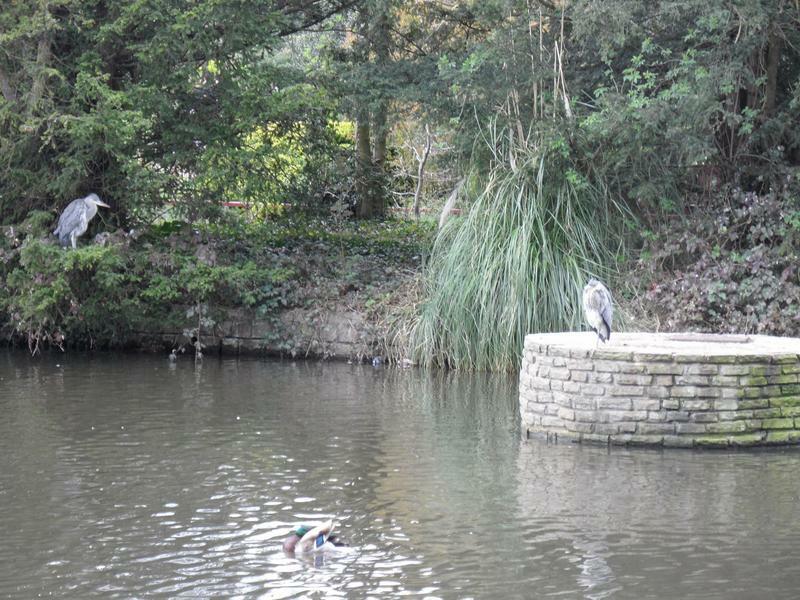 A heron waiting for food on the island. 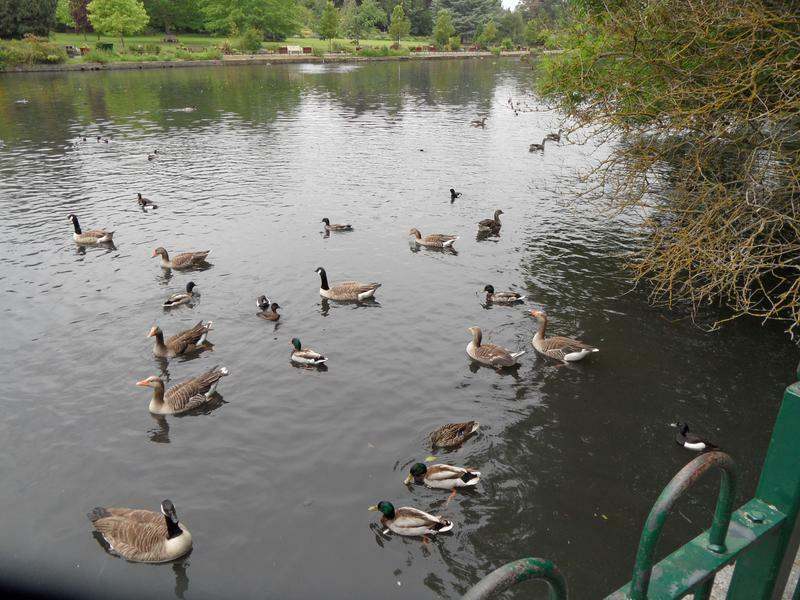 One of the most popular feeding areas on the main lake. Lots of geese and sea birds. 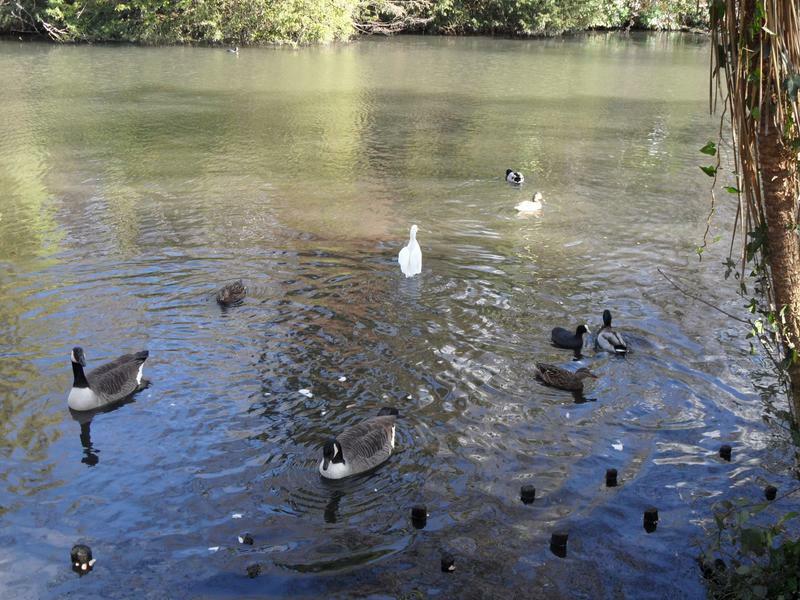 One of the swans has woken up and come looking for food.